For anyone paying attention, the biggest story of the past summer has been the fury unleashed by planet Earth as a result of climate change. 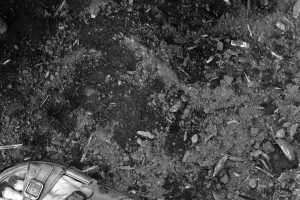 As Clive Hunter, an Australian public intellectual, said on CBC Radio’s Ideas recently, “What we’re now confronted with is a wakened, angry, raging beast.” The evidence is everywhere: the worst fire season ever in B.C. ; the worst wildfire ever in Los Angeles; hundreds of billions of dollars of hurricane devastation in Houston, the Caribbean and Florida; catastrophic flooding affecting millions in India, Nepal and Bangladesh; temperatures too hot for jets to take off in Phoenix – and the list goes on. It’s hard not to despair. Equally despairing, however, is that denial – or simply ignoring or downplaying the threat of climate change – is still rampant. And not just on the part of Donald Trump. How often does the topic come up in your own circle of family and friends? If you listened to hurricane coverage on American TV networks, you wouldn’t have even heard the words climate change. However, what climate science research has learned and is predicting for the future are facts – not ideologies, opinions or preferences. They come from three hundred years of perfecting the scientific method and are as robust and well-defended as any body of knowledge out there. Sitting back and simply being “hopeful” that things won’t be as bad as science is telling us is a recipe for even greater disaster. We cannot let skeptics dismiss these disasters as natural weather events we cannot influence. That being said, the scope of the necessary response in terms of mitigation and adaptation is far beyond anything politicians are currently proposing. Many experts believe it will require nothing less than a complete re-thinking of our economic system and of humankind’s relationship with the natural world. 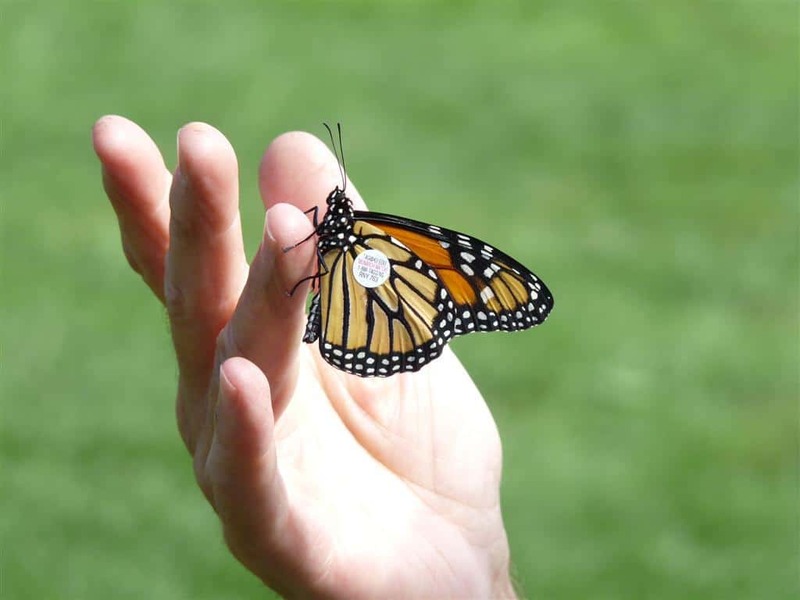 On a more positive note, a heartening story this summer has been the stellar rebound in monarch butterfly numbers. Whereas last year I may have seen a few dozen, this year I’ve observed hundreds. Don Davis, an Ontario monarch expert who tags these insects, told me this week that he found over 100 caterpillars near Cobourg in just a few hours of searching. 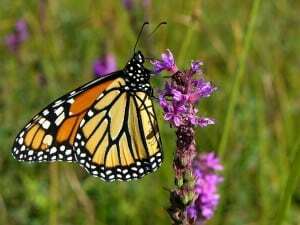 He also said that 2000 monarchs were at the tip of Point Pelee National Park on September 8 and that there were recently 100 or more on the west beaches of Presqu’ile Provincial Park. 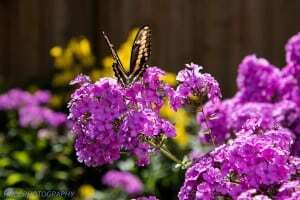 According to Dr. Chip Taylor of Monarch Watch, there is a good prospect that the overwintering population in Mexico will increase from the 2.91 hectares of last year to 4 hectares or better this coming winter. The most likely explanation for the boom in numbers is simply the weather. This summer did not see the hot, dry conditions of recent years, which killed wildflowers and reduced the availability of nectar. Weather conditions were also good this spring for the monarch’s migration from Mexico to Canada. 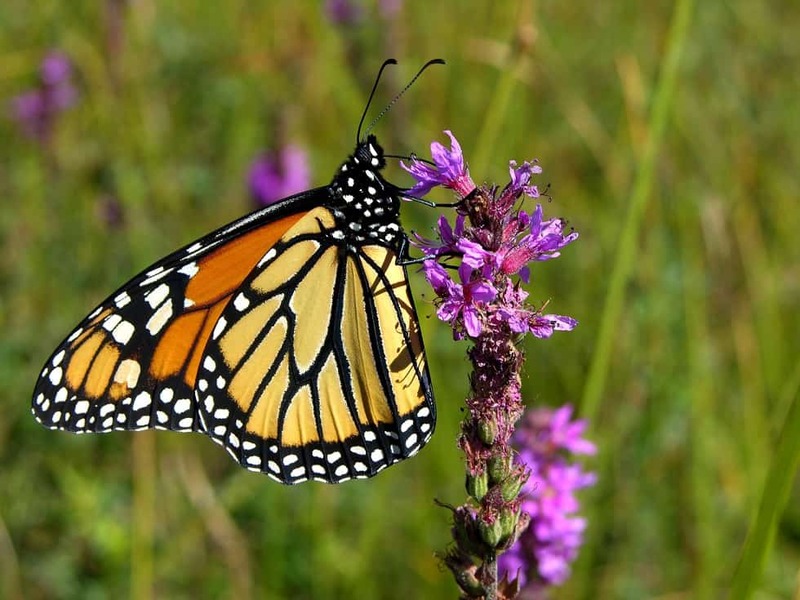 Monarchs are extremely vulnerable to weather extremes, many of which are linked to climate change. 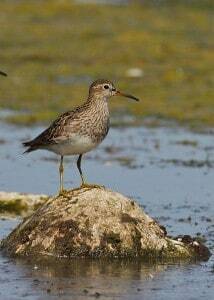 This is true during the breeding season, along the migration route and on their Mexican wintering grounds. 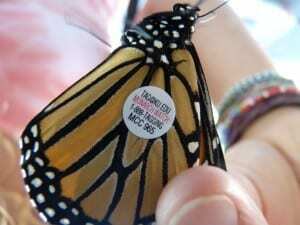 The public is becoming much more aware of the need to protect monarchs and pollinators in general. An indication of this is the growing popularity of pollinator gardens. These are gardens planted predominantly with flowers that provide nectar and pollen for a wide range of pollinator species from spring through fall. 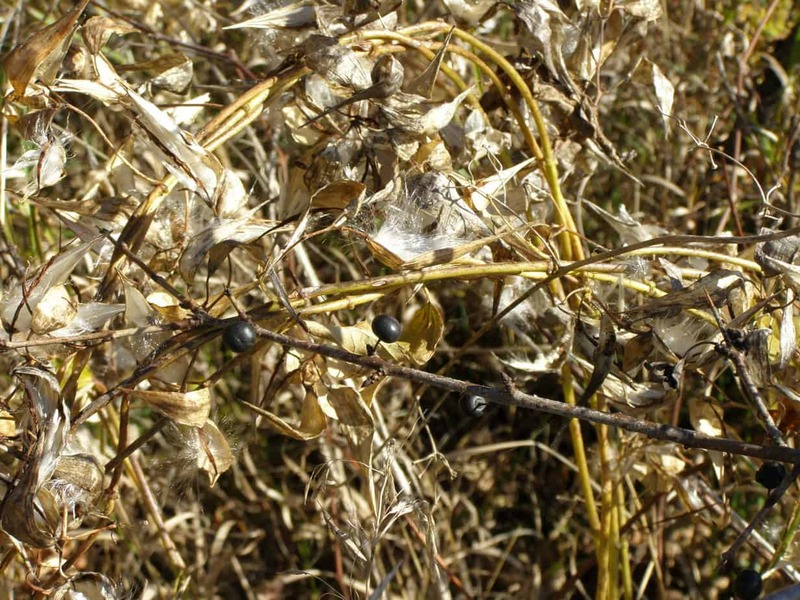 Host plants (e.g., milkweed) on which butterflies can lay their eggs should also be included. Here in the Kawarthas, nearly 180 pollinator gardens have been registered with Peterborough Pollinators, a group dedicated to creating a pollinator-friendly community. If you wish to register your garden, please go to PeterboroughPollinators.com/Register. Once registered, you can pick up a garden sign by emailing ptbopollinators@gmail.com A map of existing gardens will be on display at the Peterborough Pollinators’ booth at the Purple Onion Festival on September 24 at Millennium Park. There will also be pollinator exhibits and garden signs will be available. Looking ahead to the fall, here is a list of events in nature that are typical of autumn in the Kawarthas. 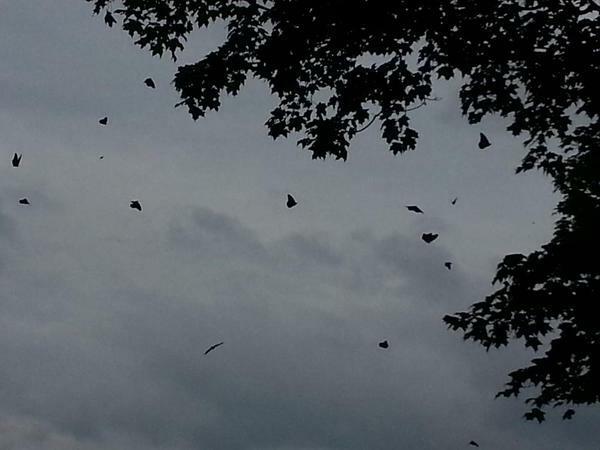 · Broad-winged hawks migrate south over the Kawarthas in mid-September. Sunny days with cumulous clouds and northwest winds are best. Watch for high-altitude “kettles”, which is a group of hawks soaring and circling in the sky. Migration usually peaks on about September 15. 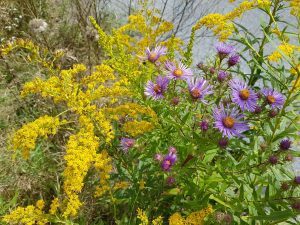 · As the goldenrods begin to fade, asters take centre stage. The white flowers of heath, panicled and calico asters, along with the purple and mauve blossoms of New England, purple-stemmed and heart-leaved asters provide much of the show. Visit http://bit.ly/2fhW4sN (Ontario Wildflowers) for tips on identifying these beautiful but under appreciated plants. 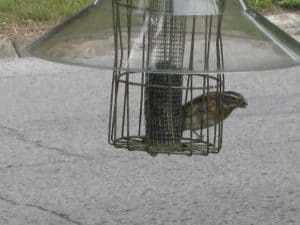 · Listen for the constant calling of blue jays and the metronome-like “chuck-chuck…” call of chipmunks, which can go on for hours. The call is often given in response to danger such as the presence of a hawk. · Fall colours in the Kawarthas usually peak early in the month. The sunshine and cool weather in September should mean excellent colour this year. County Roads 620 and 504 around Chandos Lake east of Apsley makes for a great colour drive. · Don’t miss the Harvest Moon. This year it occurs on October 5. The Harvest Moon is the full moon closest to the fall equinox (September 22). · Sparrow migration takes centre stage this month, making October one of the busiest times of the year for backyard feeders. Scatter millet or finch mix on the ground to attract dark-eyed juncos and both white-throated and white-crowned sparrows. · Indian Summer days are magical. Watch for floating threads of “ballooning” spiders. · Ecology Park holds its “Little Tree Sale” on October 15. 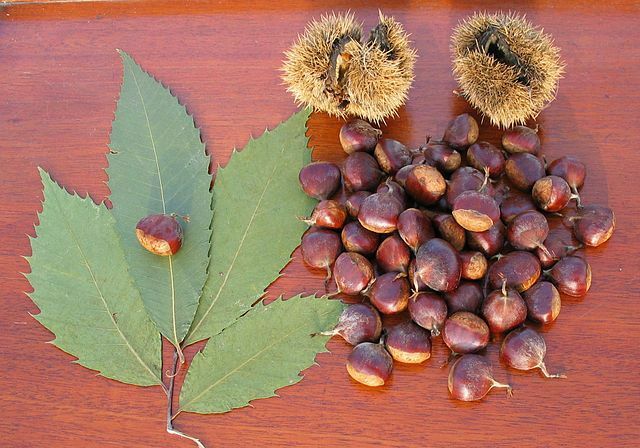 Fall is a great time to plant trees. · A tide of yellow spreads across the landscape in mid- through late October. 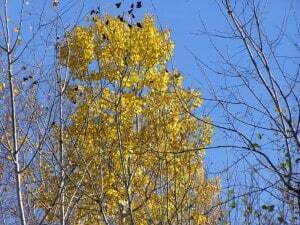 The colour is supplied courtesy of trembling and bigtooth aspens, balsam poplar, silver maple, white birch, and, at month’s end, tamarack. 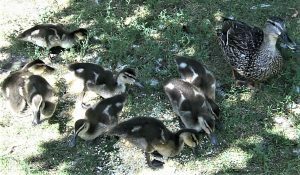 · As ducks move southward, consider a visit to the Lakefield sewage lagoon. It is located on the south side of County Road 33, just south of Lakefield. Be careful to avoid blocking the gate when you park. Goldeneye, buffleheads, scaup and mergansers are often present in large numbers. If you have a spotting scope, be sure to take it along. 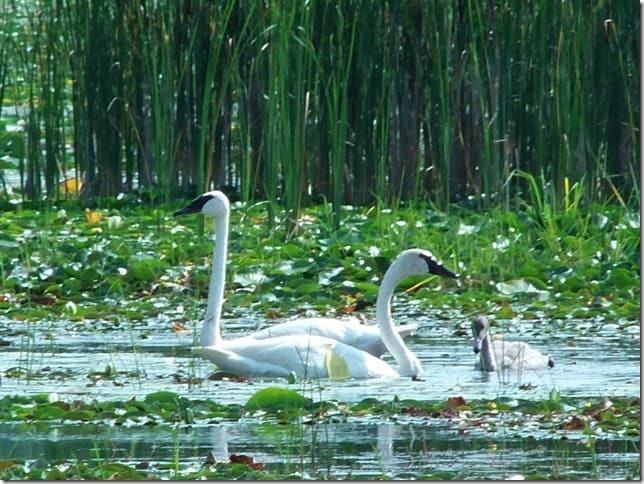 The sewage lagoon is one of the best birding locations in the Kawarthas. · Watch for Venus and Mars at dawn and Saturn in the evening. 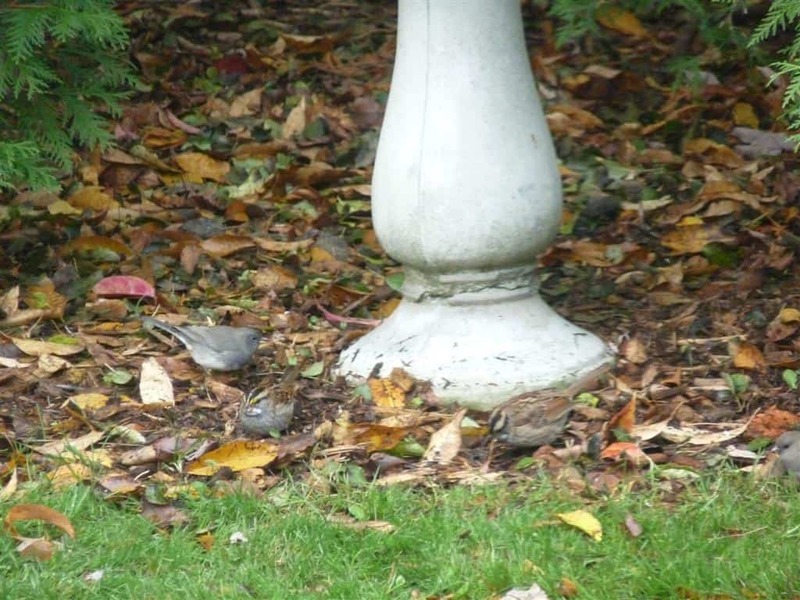 · The first northern finches usually start turning up in late October. To learn which species to expect this fall and winter, Google “winter finch forecast 2017-2018”. The forecast, compiled by Ron Pittaway, is usually available online by early October. 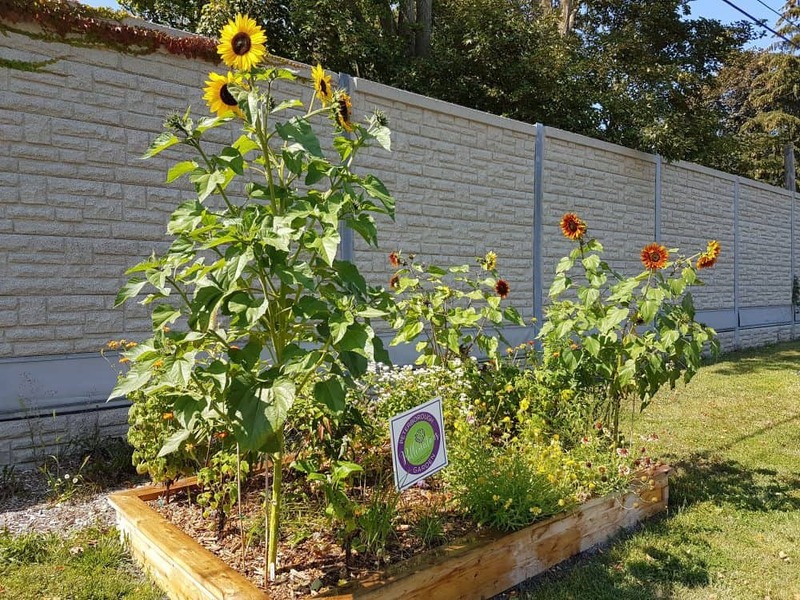 · On October 25, Jacob Rodenburg will speak to the Peterborough Horticultural Society on “Pathway to Stewardship: How we teach kids about the environment” The meeting , which is open to all, takes place at the Peterborough Lions Centre, 347 Burnham Street. · Oaks, tamaracks and silver maples are about the only native deciduous trees that still retain foliage in early November. The brownish-orange to burgundy leaves of red oaks stand out with particular prominence. 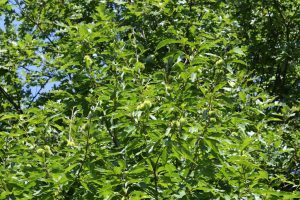 At a glance, you can see just how common oaks are in many areas of the Kawarthas. · We return to Standard Time on Sunday, November 5, and turn our clocks back one hour. Sunrise on the 5th is at 6:56 am and sunset at 4:57 pm for a total of only 10 hours of daylight. Compare this to the 15 1/2 hours we enjoyed back in June! 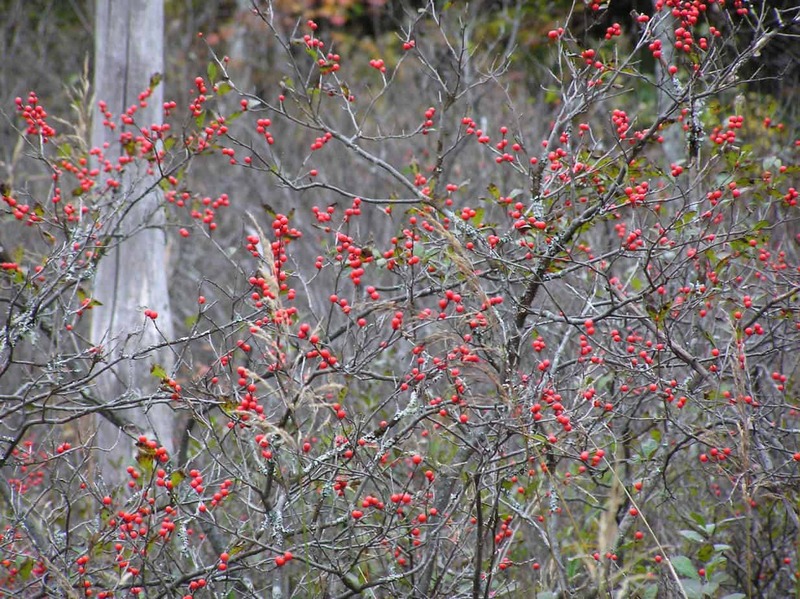 · The red berries of wetland species like winterberry holly and high-bush cranberry provide some much needed November colour. 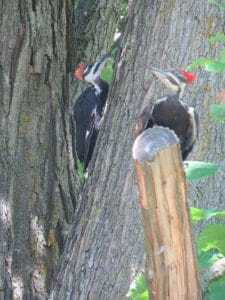 · Most of our loons and robins head south this month. However, small numbers of robins regularly overwinter in the Kawarthas. Their numbers will likely be much lower than last year, given the small wild grape crop. Grapes are a staple food for winter robins. 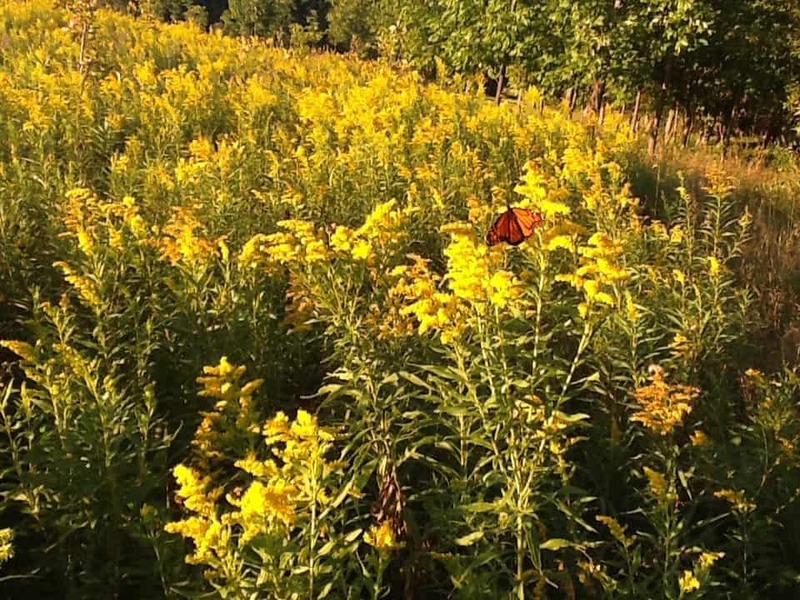 · Ball-like swellings known as galls are easy to see on the stems of goldenrods. 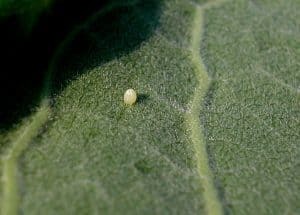 If you open the gall with a knife, you will find the small, white larva of the goldenrod gall fly inside. In the spring, it will emerge as an adult fly. 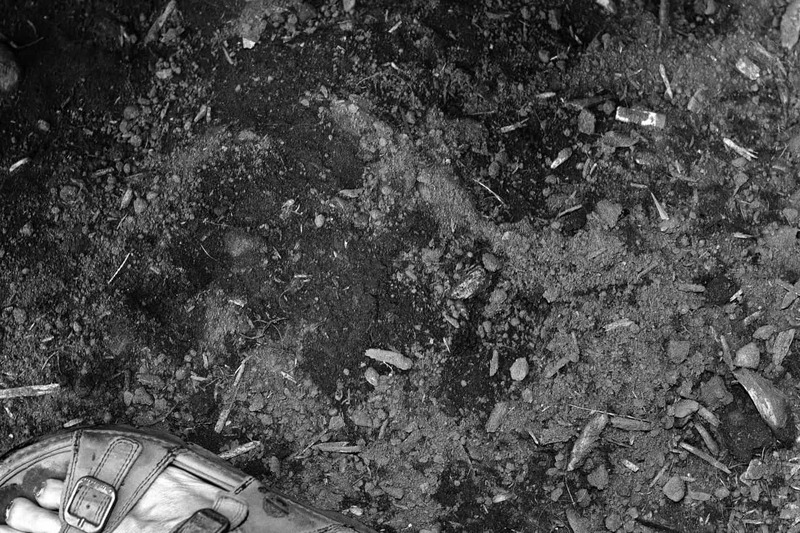 · Damp, decomposing leaves on the forest floor scent the November air. 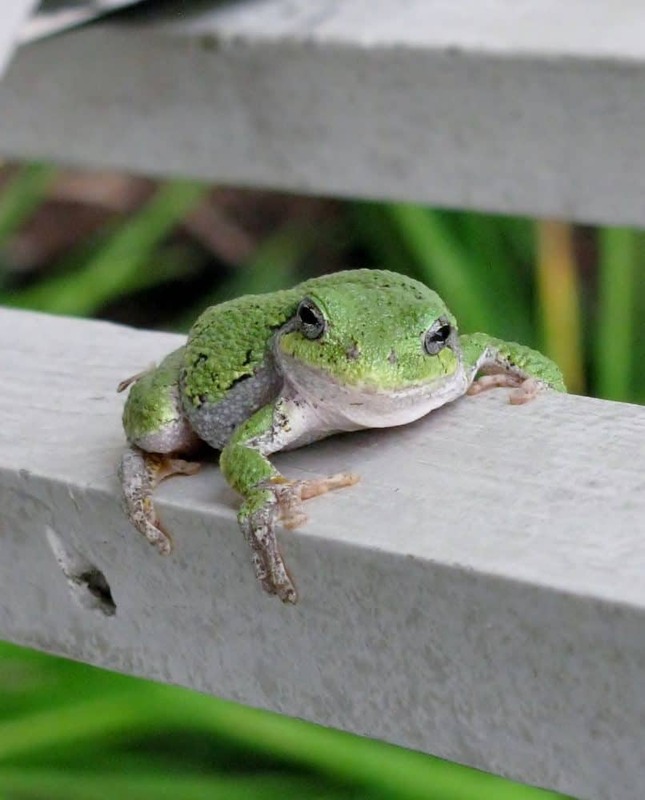 · With the onset of cold temperatures, wood frogs, gray treefrogs, chorus frogs, and spring peepers take shelter in the leaf litter of the forest floor and literally become small blocks of amphibian ice. Glycerol, acting as an antifreeze, inhibits freezing within the frogs’ cells. I would like to thank Martin and Kathy Parker, Tim Dyson, Cathy Dueck and Gordon Johnson for having done such an admirable job filling in for me this summer. We are fortunate in the Kawarthas to have so many people with extensive knowledge of nature and environmental education. Here’s a picture of a stink bug ? 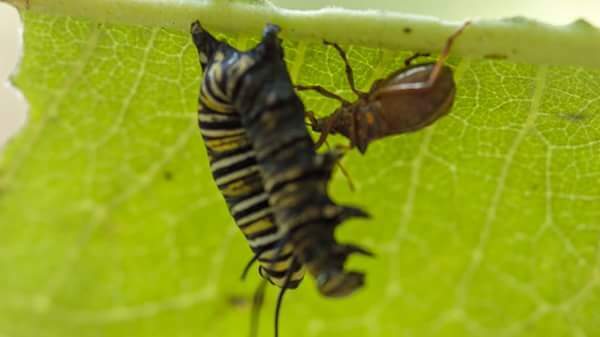 sucking the life out of a monarch caterpillar, taken in mid-August. The photos are extracted from an image sequence shot from video camera. Yesterday, I went on a monarch caterpillar hunt with my two nephews. First we found another dead caterpillar, all life sucked out and black in colour. We then found another in a paralyzed state. I set my video camera up to film the same scene with the bug sucking the life out of caterpillar. 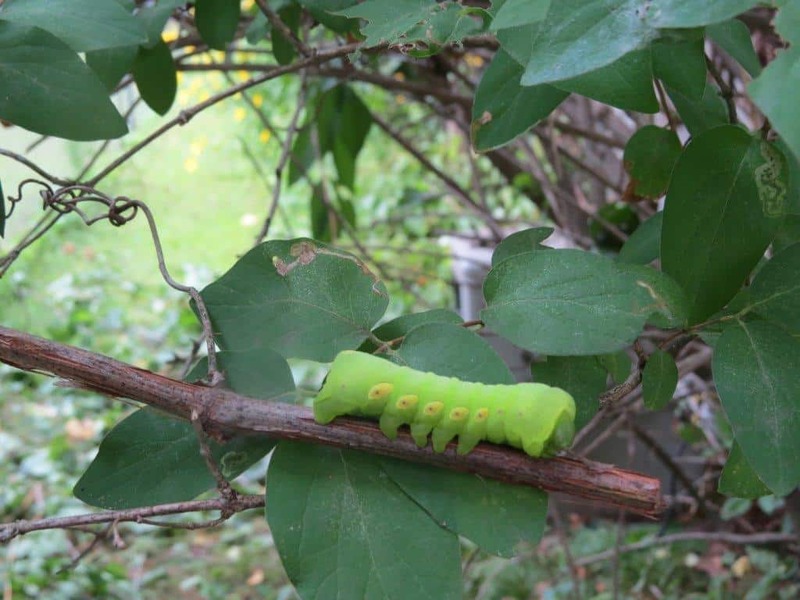 Last week, we found four caterpillars. The Monarch I’ve been monitoring emerged from its chrysalis on September 18. It is the only one I have been able to find. The other caterpillars I was watching disappeared. My parents have sightings of at least a couple other Monarchs. 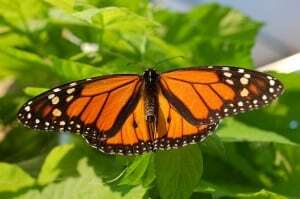 Note: A Monarch visited our garden on September 22 and nectared on the Mexican Sunflowers. Looking back at the summer of 2016, two words come immediately come to mind: drought and heat. August was a whopping 3.7 C warmer than the 1971-2000 average, while as of this week, September is about 3 C above normal temperatures. As for precipitation, July only saw one-third of normal rainfall. Precipitation was heavier in August but still only about half of what our region usually receives. The combination of drought and intense heat was hard on our flora and fauna. 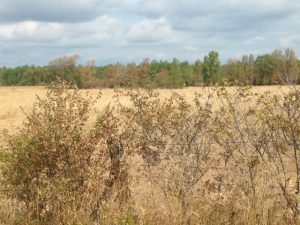 Entire fields turned a ubiquitous brown, which meant that butterflies struggled to find nectar and healthy plants to lay eggs on. Monarchs may have been especially hard hit as only a handful of sightings were reported over most of the summer. Numbers have increased somewhat in recent weeks, however. On September 5, for example, I had three monarchs visiting my garden together. According to Dr. Chip Taylor of Monarch Watch, the continent-wide data to this point suggest that this year will be a repeat of 2014 with a significant decline in both migration and overwintering numbers. The drought has also resulted in a number of trees changing colour and/or shedding leaves much earlier than usual. Oaks growing in the thin soils northern Peterborough County have suffered with many trees turning a sickly shade of brown. Most should be able to recover, however, as long as precipitation levels return to normal this fall and over the coming winter and spring. 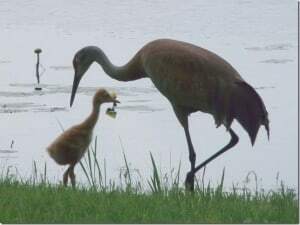 The drought has also been hard on birds and other animals as fewer young have been able to survive. A lack of nuts and berries, for example, is proving difficult for bears, which may result in more conflicts with humans as they search for food. Lower water levels and increased water temperatures have been hard on fish, too, especially cold-water species like brook trout. 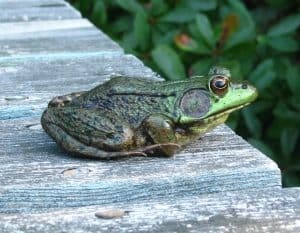 As water levels dropped in wetlands, frogs were more vulnerable to predators such as herons and raccoons, while some turtles were forced to roam widely afield in search of appropriate habitat. It’s likely that many did not survive the journey. 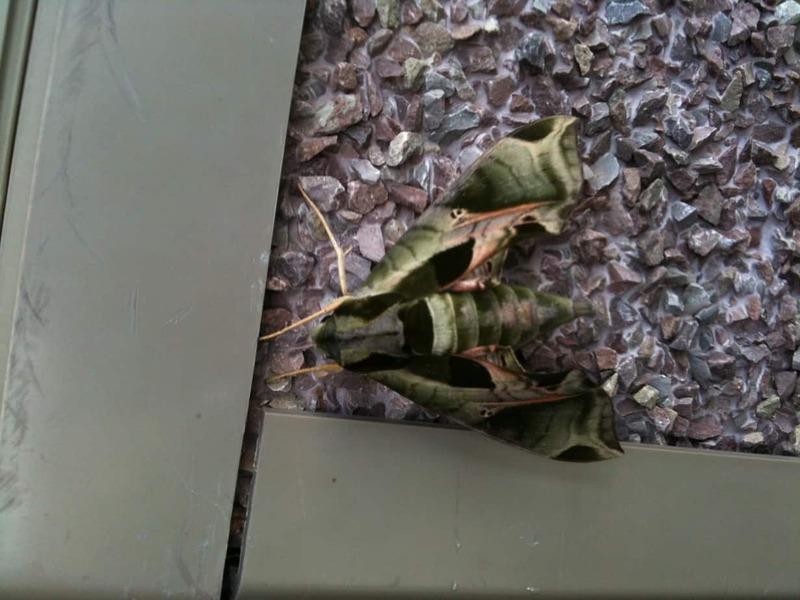 In other news this summer, a new species of butterfly was recorded for Peterborough County. On June 21, Jerry Ball and Ken Morrison found a female pipevine swallowtail on Sandy Lake Road, off Highway 46 north of Havelock. 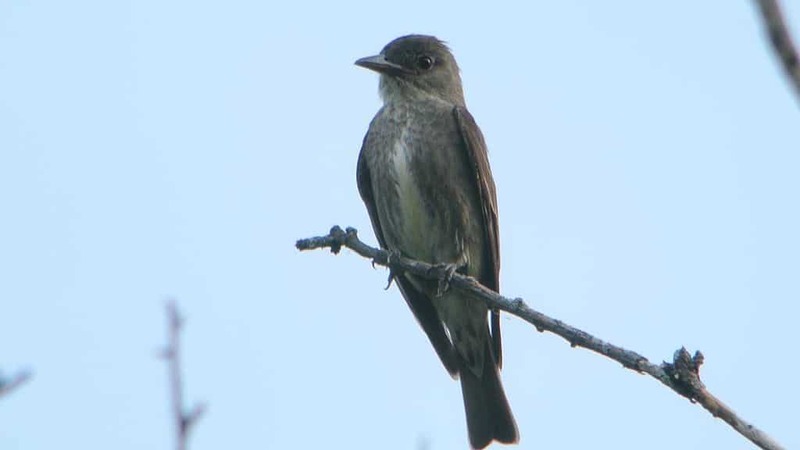 This species is usually restricted to the Carolinian zone of southwestern Ontario. 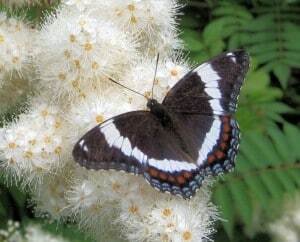 With climate change, more and more butterflies are extending their range northward. The giant swallowtail is a well-known example. The common loons that nested on the Otonabee River, just north of Lock 25, appear to have been successful in raising their two young. On August 19, Dave Milsom observed and photographed the two juvenile loons with an adult. The young loons were constantly flapping their wings in preparation for their first flight. There was also encouraging news regarding chimney swifts, a species at risk in Ontario. In a citizen science monitoring program known as Swift Watch, Dan Williams observed 123 swifts entering a chimney behind Wildrock on Charlotte Street. On June 6, Ariel Lenske saw 83 birds fly into the same roost, where they spend the night. 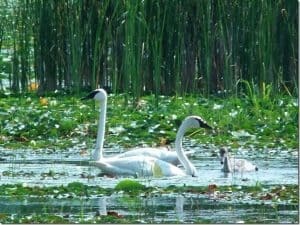 Finally, Loggerhead Marsh, located on Ireland Drive in west-end Peterborough, has just been classified as a provincially significant wetland. This designation normally means that no structures can be built within a 120 m buffer zone bordering the wetland. This is welcome news for such a rich and easily accessible nature-viewing destination. As the autumn equinox quickly approaches, here is a list of events in nature that are typical of fall in the Kawarthas. If the mild weather continues, however, some events may occur later than usual. Not surprisingly, this has become the norm as climate change tightens its grip. Broad-winged hawks migrate south over the Kawarthas in mid-September, especially on sunny days with cumulous clouds and northwest winds. Watch for high-altitude “kettles”, which is a group of hawks soaring and circling in the sky. 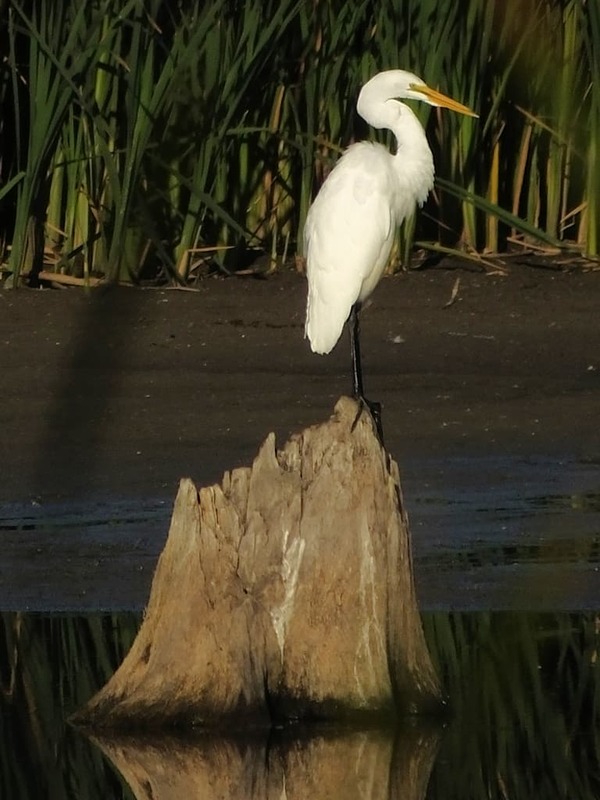 For your best chance of seeing this phenomenon, consider a trip to Cranberry Marsh, located on Halls Road at the Lynde Shores Conservation Area in Whitby. Expert hawk watchers are on hand each day. 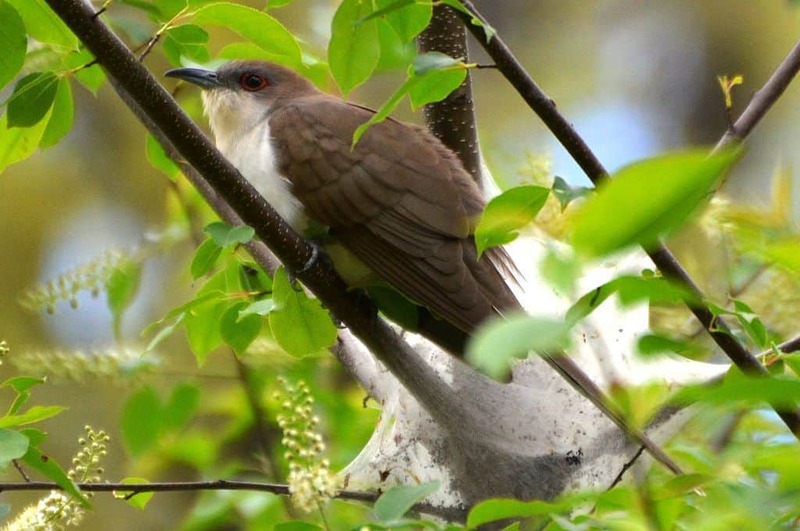 Thousands of broad-wings pass over this area in mid-month every year. As the goldenrods begin to fade, asters take centre stage. The white flowers of heath and calico asters, along with the purple and mauve blossoms of New England and heart-leaved asters provide much of the show. 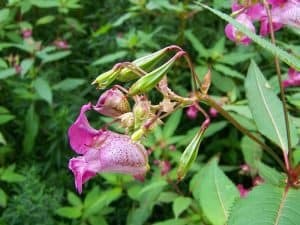 Visit ontariowildflowers.com for tips on identifying these beautiful but under appreciated plants. Listen for the constant calling of blue jays and the metronome-like “chuck-chuck…” call of chipmunks. The call is often given in response to danger such as the presence of a hawk. Chipmunk numbers are high this year, partly because of a strong acorn crop last fall, which allowed most of these small squirrels to overwinter successfully and have large litters. Fall colours in the Kawarthas usually peak early in the month. However, because of the hot, dry weather this summer, leaf colour is expected to be more muted than usual. County Roads 620 and 504 around Chandos Lake east of Apsley makes for a great colour drive. Sparrow migration takes centre stage, making October one of the busiest times of the year for backyard feeders. Scatter millet or finch mix on the ground to attract dark-eyed juncos and both white-throated and white-crowned sparrows. 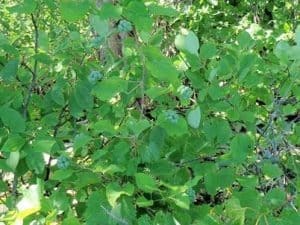 On October 12, Mike McMurtry, a recently retired ecologist from the Natural Heritage Information Centre, will be speaking to the Peterborough Field Naturalists on “Learning the Plants of the Kawarthas”. The talk will provide tips for identification and conclude with a quiz. The presentation begins at 7:30 pm at the Camp Kawartha Environment Centre on Pioneer Road. Everyone is welcome. 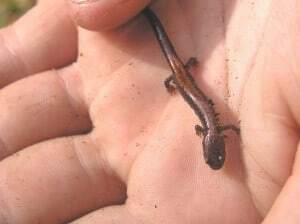 Fall is a great time to find salamanders. 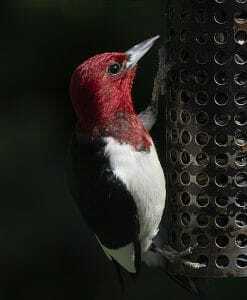 The red-backed, which is almost worm-like in appearance, is usually the most common. Look carefully under flat rocks, old boards, and logs in damp wooded areas and around cottages. A tide of yellow spreads across the landscape in mid- through late October. 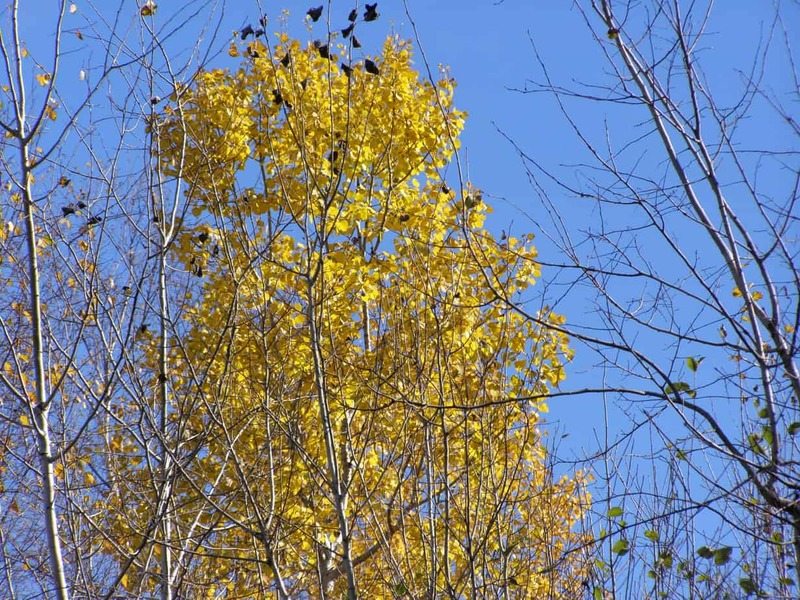 The colour is supplied courtesy of trembling and bigtooth aspens, balsam poplar, silver maple, white birch, and, at month’s end, tamarack. As ducks move southward, consider a visit to the Lakefield sewage lagoons, which are located on County Road 33, just south of Lakefield. Just be careful to avoid blocking the gate when you park. 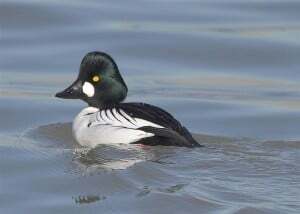 Goldeneye, buffleheads, scaup and mergansers are often present in large numbers. If you have a spotting scope, be sure to take it along. If you find a Halloween bat in your house, it is probably a big brown. This species often overwinters in buildings. Little browns, on the other hand, choose caves and abandoned mines as winter quarters. 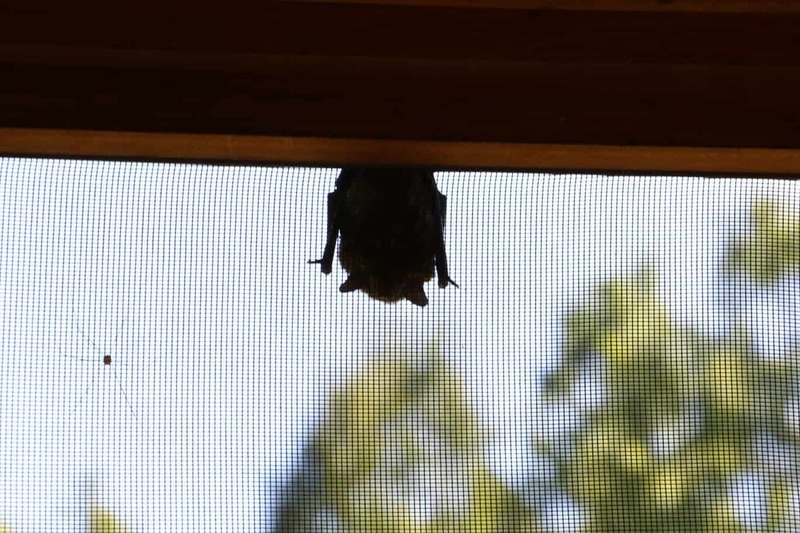 Their population is in a free-fall because of White Nose Syndrome. Big browns are less susceptible to the disease. The first northern finches usually start turning up in late October. To learn which species to expect this fall and winter, Google “winter finch forecast 2016-2017”. The forecast, compiled by Ron Pittaway, is usually available online by early October. Oaks, tamaracks and silver maples are about the only native deciduous trees that still retain foliage in early November. 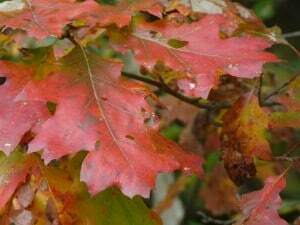 The brownish-orange to burgundy leaves of red oaks stand out with particular prominence. 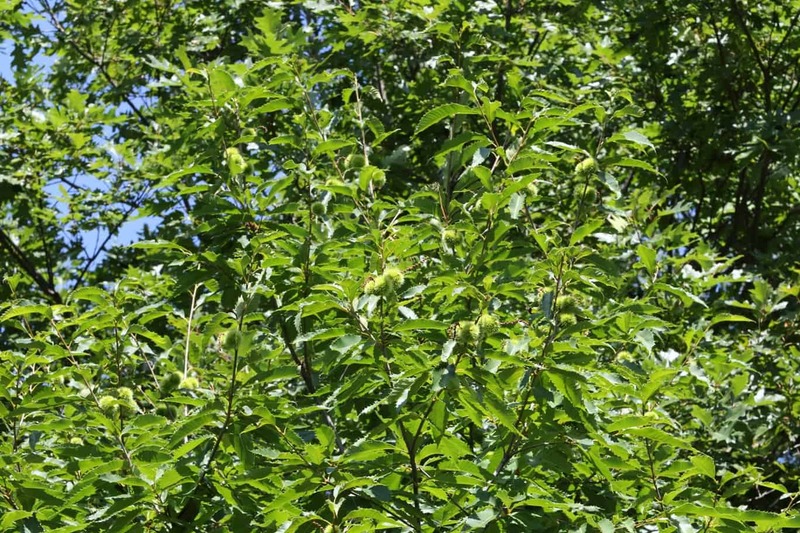 At a glance, you can see just how common oaks are in many areas of the Kawarthas. We return to Standard Time on November 5th and turn our clocks back one hour. Sunrise on the 5th is at 7:56 am and sunset at 5:57 pm for a total of only 10 hours of daylight. Compare this to the 15 1/2 hours we enjoyed back in June! 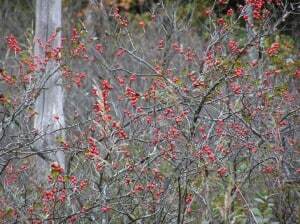 The red berries of wetland species like winterberry holly and high-bush cranberry provide some much needed November colour. Most of our loons and robins head south this month. However, small numbers of robins regularly overwinter in the Kawarthas. Their numbers should be particularly high this year, thanks to a plentiful wild grape crop. Grapes are a staple food for winter robins. Ball-like swellings known as galls are easy to see on the stems of goldenrods. 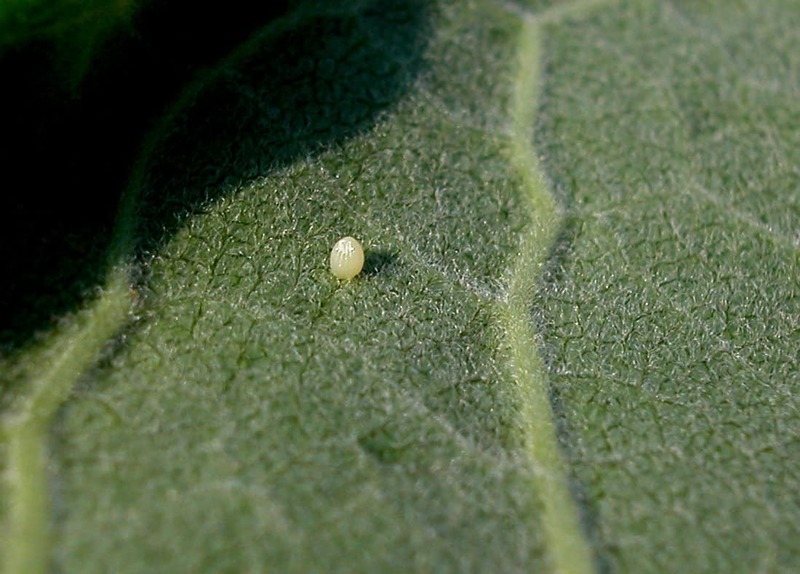 If you open the gall with a knife, you will find the small, white larva of the goldenrod gall fly inside. 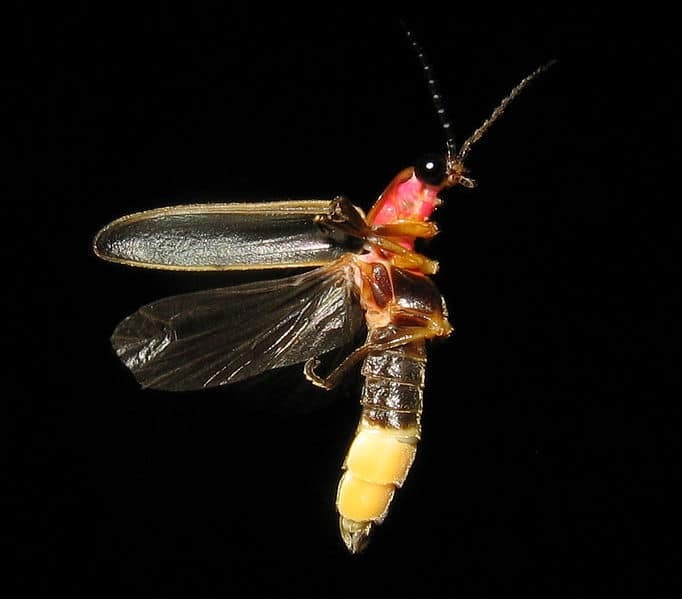 In the spring, it will emerge as an adult fly. Damp, decomposing leaves on the forest floor scent the November air. With the onset of cold temperatures, wood frogs, gray treefrogs, chorus frogs, and spring peepers take shelter in the leaf litter of the forest floor and literally become small blocks of amphibian ice. Glycerol, acting as an antifreeze, inhibits freezing within the frogs’ cells. I would like to thank Martin and Kathy Parker, Tim Dyson, Cathy Dueck and Jacob Rodenburg for having done such an admirable job filling in for me this summer. We are fortunate in the Kawarthas to have so many people with extensive knowledge of the natural world. I had two Monarchs in our garden on August 26. They were attracted to our Buddleia (Butterfly Bush) and Mexican Sunflower (Tithonia). I’ve also seen several north of Peterborough in recent days. 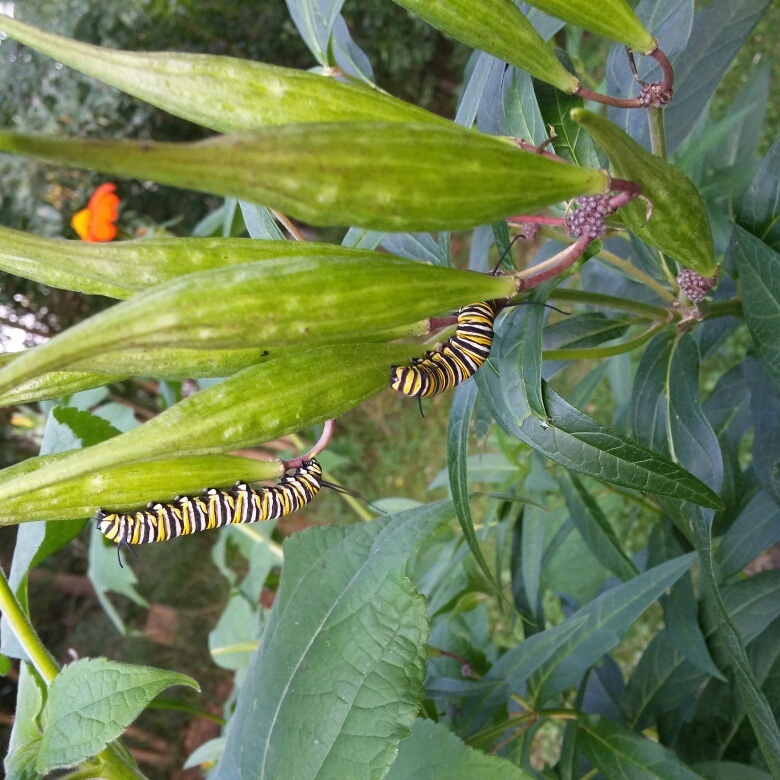 A number of reports of Monarch caterpillars around Warsaw were reported to me, too. 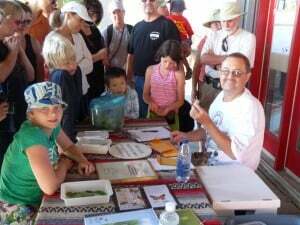 Don Davis will once again be tagging Monarchs at Presqu’ile Provincial Park on the Saturday and Sunday of Labor Day Weekend. He told me he’s finding eggs and small larvae in fields in the Cobourg area. Numbers aren’t great, but at least there are some. If you’ve never seen Don’s tagging demonstration, it’s a great event. Kids get to actually hold and release the tagged adult Monarchs. You can also ask Don any questions you might have about these amazing butterflies. 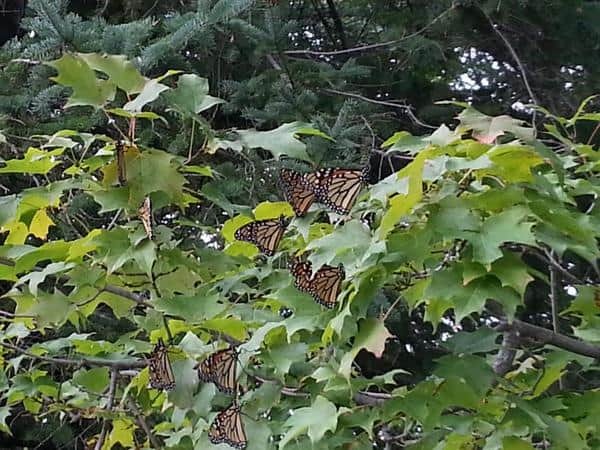 Posted by Drew Monkman	Tagged with: Monarchs, Presqu'ile P.P. 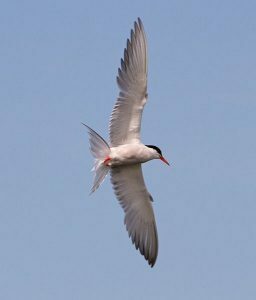 As most of you know, the summer of 2015 produced a strong migration and a relatively large overwintering population (4.01 hectares). To place this population growth in context, let’s review the last several years. The population declined following each of the three growing seasons from 2011-2013. There were aspects of each season that account for these declines. For example, the temperatures from March through August in 2012 were warmer – actually hotter – than for any year going back to 1895. Monarchs arrived in the northern breeding area in good numbers in early May but altogether too early, and the hot/dry summer that followed dried up milkweeds and nectar sources leading to a significant decline in the migration and the overwintering population. 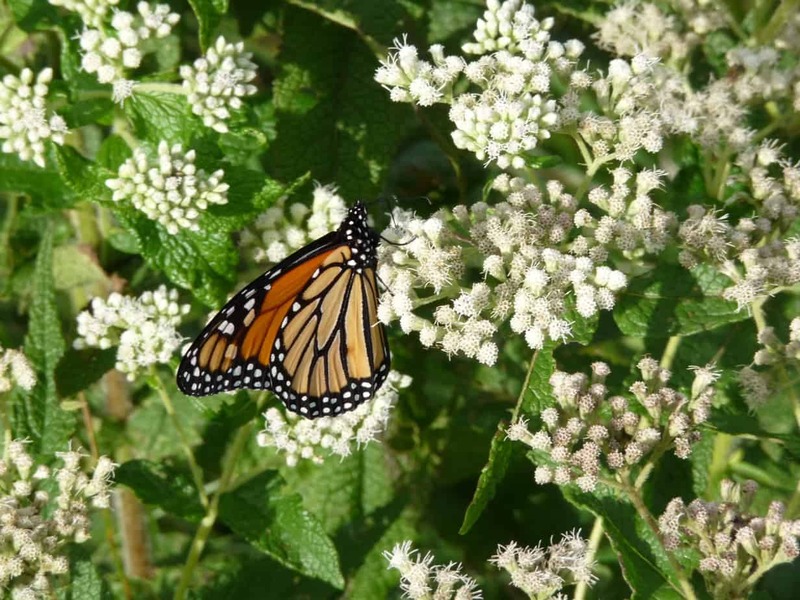 In 2013, a cold period during the first three weeks of May restricted movement of the first generation monarchs produced in Texas and Oklahoma into the northern breeding range resulting in a much later than normal recolonization of this region. This pattern also led to a decline, with the lowest overwintering population on record (0.67 hectares). Conditions were somewhat better in 2014 and the population increased to 1.13 hectares in spite of the low numbers of overwintering monarchs returning to the South region. If you go back through the older Monarch Population Status reports, you will see that I was excited about the prospect of the population increasing in the spring of 2015. Later in the summer I dialed back my expectations when I didn’t receive the positive reports I was expecting. 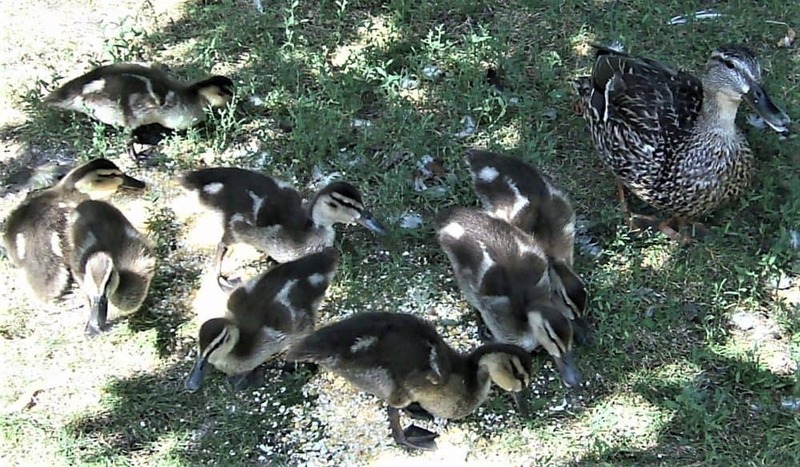 Then, in the critical period from 20 July to 10 August, when most of the eggs are laid that produce the fall generation, a significant number of reports and observations suggested that the population would increase substantially. Still, I was cautious and predicted overwintering numbers of less than 3 hectares. I missed by a hectare or more. Going back over all the data I look at to come up with these estimates, I see where I made my mistake. I underestimated the number of monarchs arriving in the northern breeding area in May and early June. The starting numbers were larger than I realized and I never picked up on that, hence my underestimate of where the population was headed. Being wrong is part of the process and is ok as long as I learn from my mistakes. This leads me to the end of June prediction for 2016. Unfortunately, in the words of Yogi Berra – “It’s like déjà vu all over again.” Meaning that all the data to this point in time suggest that this year will be a repeat of 2014 with a significant decline in the migration and the overwintering numbers. 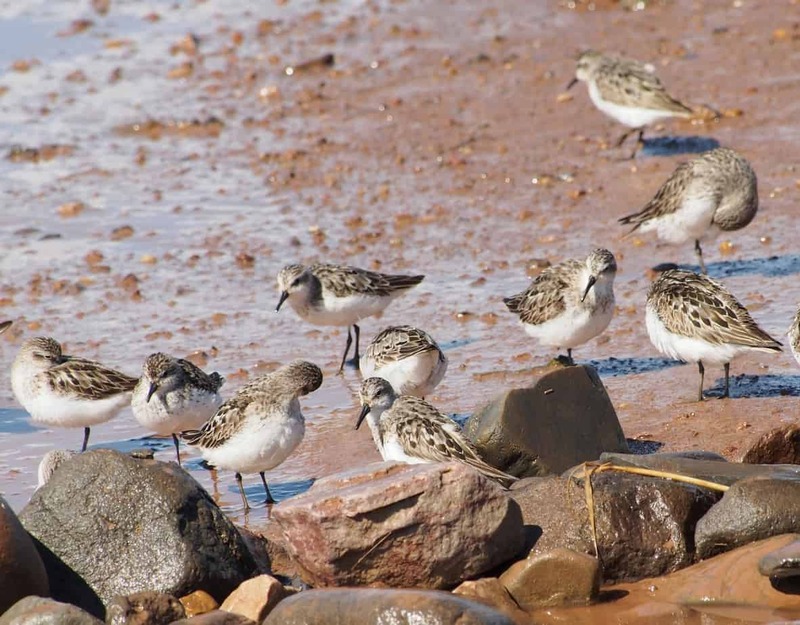 While the overwintering population may not be as low as 2014 (1.13 hectares), the overwintering numbers for 2016 are unlikely to exceed 2 hectares. Summer temperatures throughout the breeding area are projected to be close to normal and that should favor population growth. There are no extreme conditions on the horizon though local droughts could impact the population in some areas. The problem this year seems to be the low numbers of first generation monarchs moving north in May and early June. As best I can tell, these numbers are quite similar to those reported in 2014. 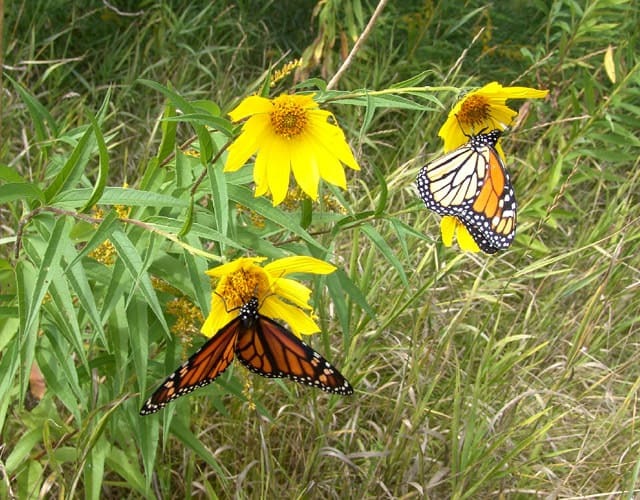 First sightings reported to Journey North for Texas in March and April were lower than normal this spring with numbers closer to 2013 than 2014 and, while it is difficult to make strong inferences from first sightings, they do provide an indication of how many monarchs are returning from the overwintering sites in Mexico. The lower numbers this spring may reflect the mortality that occurred at the colony sites as a consequence of the sleet storm that occurred from the 8-9th of March. Although some monarchs had left the colonies before the storm, many remained. 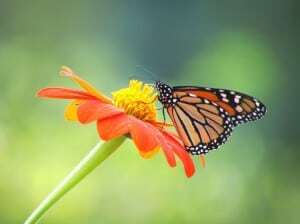 Mortality estimates varied from observer to observer and from colony to colony with the highest rate of mortality being 50% for El Rosario, the colony with the greatest number of monarchs. We will never have a comprehensive assessment of the impact of this weather event but it does appear to have been significant. The low return could well have led to low numbers moving north in May and June but the conditions in the May-June interval were less than favorable for northward movement. 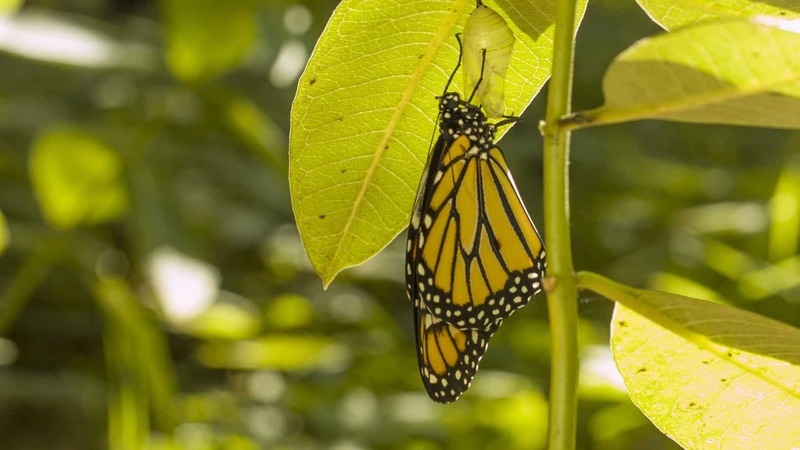 Monarchs generally arrived later than normal in the breeding areas with many locations reporting extremely low numbers of sightings or eggs for periods when monarchs are normally present. Interestingly, there was a 10-day or longer period in the North East during which conditions were favorable for recolonization. I expected monarchs to flow into this area at that time since they have done so in the past under similar conditions but only a few did – suggesting that the number of first generation monarchs moving north was indeed quite low. My analysis (or guesswork, if you prefer) suggests that the largest numbers of monarchs will be produced from the eastern Dakotas, Minnesota, Iowa, southern Wisconsin and Michigan, northern Illinois with lower production as one moves eastward from Illinois. Numbers will be down in Pennsylvania, New York and most of the East north of Maryland. Populations at Peninsula Point (Michigan), Long Point (Ontario), Point Pelee (Ontario) and Cape May (New Jersey) will be lower than normal. 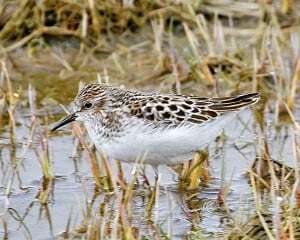 The numbers at Cape May are likely to be even lower than last year – a year in which the daily census produced a mean number of sighting that was only about a third that of the long term average. 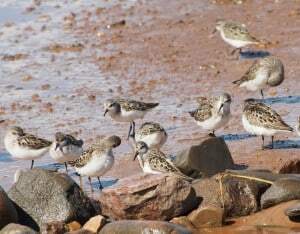 Ontario and Quebec are off to a slow start and, even with favorable weather, the fall population is likely to be quite low. While it is clear that habitat loss is the main factor that accounts for the overall decline in monarch numbers, we need to keep in mind that there is considerable inter-annual variation due to weather conditions that both favor or limit population growth. My thanks to Janis Lentz for providing summaries of first sightings and to Journey North and their participants for posting their observations. 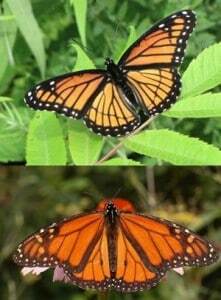 I just wanted to let you know that I saw 2 Monarchs yesterday at Kawartha Trails Resort, just south of Peterborough. 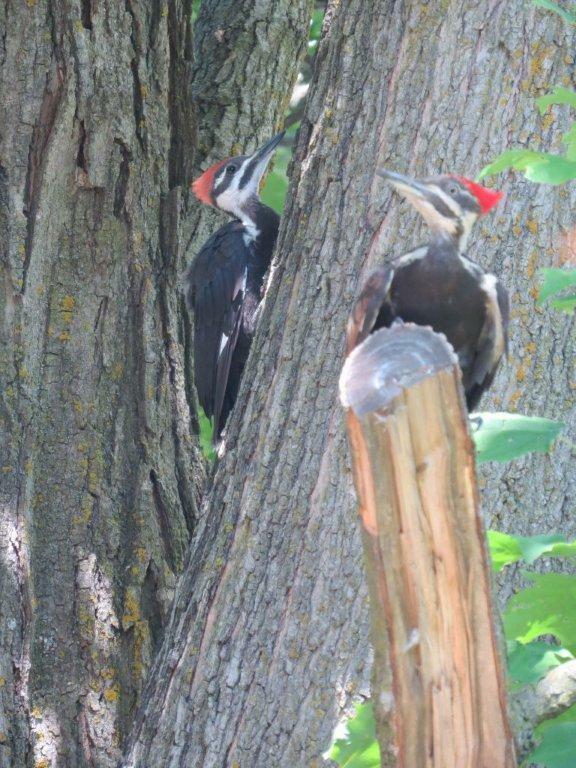 They were visiting the milkweed along the edge of the Otonabee River. Note: I have seen no Monarchs in Peterborough County since mid-June when I saw just one. D.M. to me) this year, and some regarded as “rare or uncommon” by Covell in his “Moths of Eastern North America”. Today, June 15, I saw my first Monarch butterfly of the year. It was flying in a field at the corner of County Road 46 and Round Lake Road, north of Havelock. This Viceroy landed on my lawn mower today, June 9. 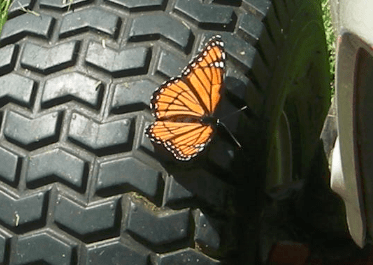 At first I thought it was a Monarch, but I then noticed the black, horizontal line on the hind wings. Viceroy (above) and Monarch. Notice the horizontal line on the hind wings. For years, my wife and I have wanted to explore California’s legendary Highway 1, which runs along the Pacific coast. It is one of the world’s most scenic drives. Our anticipation was therefore at a peak when we took the storied highway out of San Francisco on a two-day trip down to Monterey and Big Sur. The drive is exactly what we hoped for – only better. Mile after mile of undeveloped coastline offered up a non-stop parade of beautiful sand dunes, unspoiled beaches and precipitous cliffs. With the added bonus of sunny, warm weather, the drive evoked classic California pop songs like “Ventura Highway”. Not surprisingly, the challenge was keeping our eyes on the road. Red-tailed hawks and turkey vultures soared constantly overhead, while American kestrels, red-shouldered hawks and western meadowlarks perched on roadside fences and telephone wires. Each time we pulled off onto one of the many roadside lookouts, small flocks of Brewer’s blackbirds, California towhees and the ubiquitous white-crowned and golden-crowned sparrows scurried into the grass, only to reappear moments later. Monarch butterflies, too, sailed by, often in pairs. 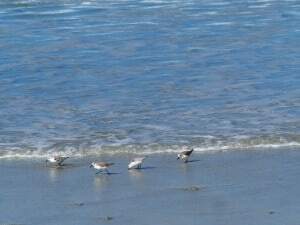 Out over the ocean, there was a steady procession of Brandt’s cormorants, western and California gulls and sea ducks like scoters and mergansers. The first plant to catch my eye was highway iceplant (Carpobrotus edulis), a ground-hugging species with succulent, three-sided leaves and large pink or magenta flowers. Native to coastal South Africa, it forms extensive mats and outcompetes native species for resources. As we approached Monterey, we entered a huge area of wetlands known as Elkhorn Slough. 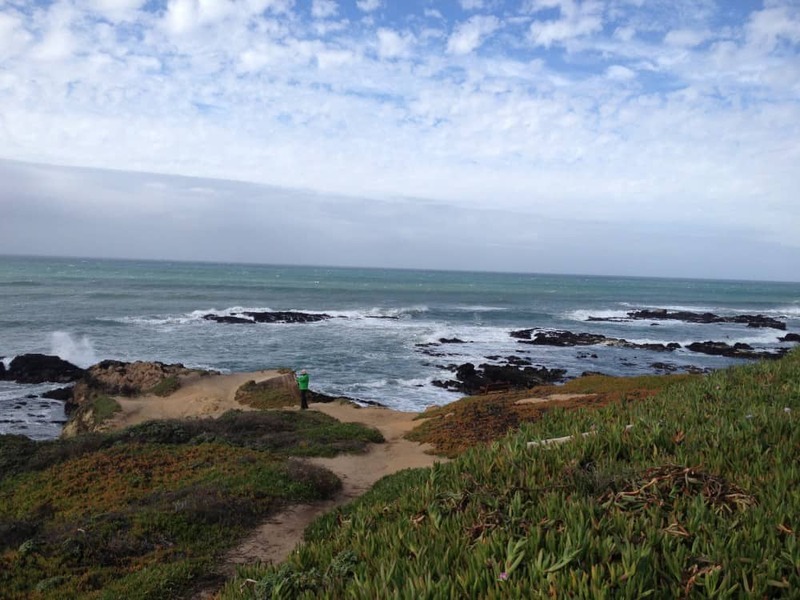 We stopped here to explore the Moss Landing Wildlife Area, which was teeming with wildlife. 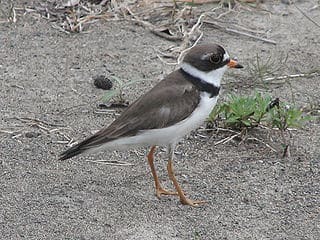 Interpretive signs explained that what were once salt evaporation ponds now provide critical breeding habitat for threatened western snowy plovers. Volunteers actually go out onto the damp mud in early spring to stomp about with their feet to create shallow impressions as nesting sites. Although we didn’t see any of the plovers, we were entertained by hundreds of western sandpipers, willets, whimbrels, black-bellied plovers, greater yellowlegs, and marbled godwits. Brown pelicans and both snowy and great egrets were also easy to spot. 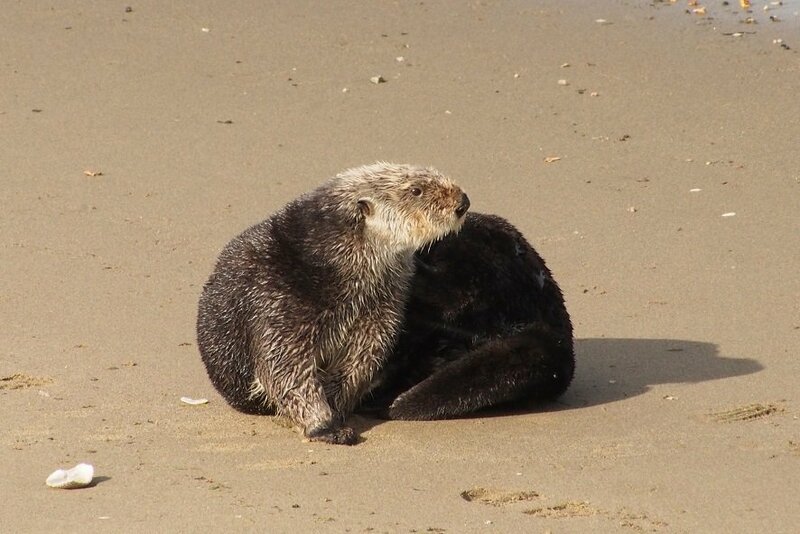 The high point, however, was getting leisurely, close-up views of at least a dozen sea otters. Some were floating on their backs, while others were on the beach. Sea otters were once hunted into near oblivion for their pelts. 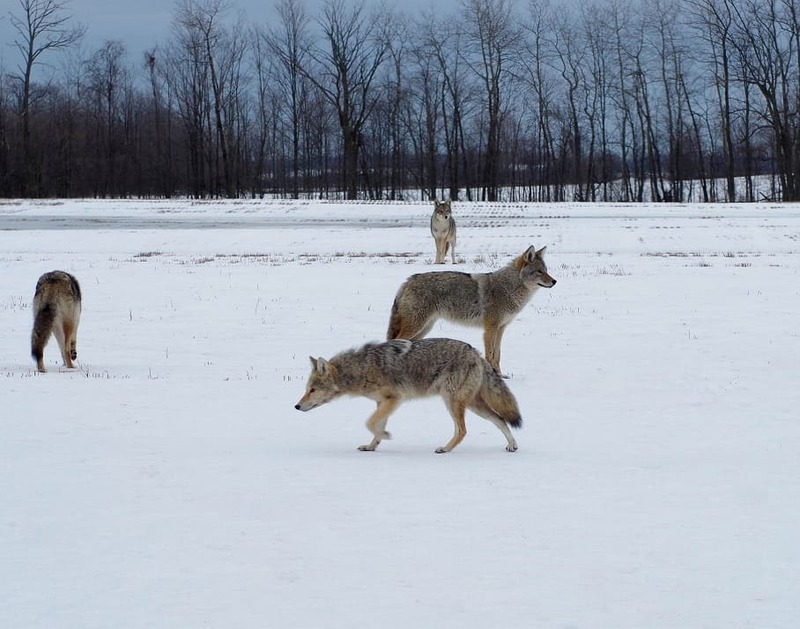 Now, through massive conservation efforts, their numbers are rebounding. Sea otters feast on kelp-eating urchins – baseball-sized, spiny echinoderms. By keeping urchin numbers in check, the otters allow giant kelp “forests” to thrive. This benefits thousands of other species in the marine ecosystem. I also took some time to walk the trails of the nearby 1400-acre Elkhorn Slough National Estuarine Research Reserve. The huge slough provides a crucial feeding and resting ground for many kinds of migrating waterfowl and shorebirds. One trail wound through stands of coast live oak (Quercus agrifolia), where I enjoyed great views of acorn woodpeckers, chestnut-backed chickadees, spotted towhees and my first ever Hutton’s vireo and Say’s phoebe. Although some of the trees had been clearly affected by the four-year drought, the early winter rains this year had greened the landscape. When we arrived in Monterey, the first thing we did was drive over to Pacific Grove, which is famous for its overwintering monarchs. The butterflies arrive here in November and remain through late February. Although many of the monarchs had already left, we were able to find several dozen clustered on the branches of some of the eucalyptus and Monterey pines. The annual census of 187 coastal California wintering sites showed an increase in monarch numbers this year. However, the population is still 39% below the long-term average. 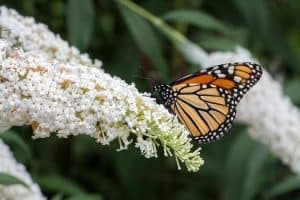 The next morning, I visited the Pacific Grove Museum of Natural History, which provides information on the monarchs as well as great exhibits on nearly all of the state’s flora and fauna. Another highlight of the Monterey area was 17-Mile Drive with its shorebird-dotted beaches – sanderlings were everywhere – and craggy rocks. At Bird Rock, we saw dozens of California sea lions. 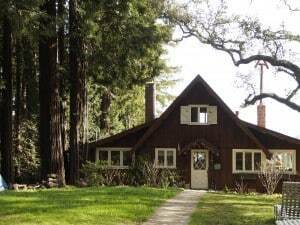 After lunch in leafy Carmel-by-the-Sea, a town of fairytale cottages, stately trees and an upscale shopping district, we continued southward towards Big Sur. Although Highway 1 had already delivered spectacular scenery, the drive from Carmel to Big Sur was even more jaw-dropping with its cypress and redwood forests, bucolic meadows, colossal cliffs, crashing waves and elegant bridges. I kept an eye on the sky, too, hoping to see a California condor. With a wingspan of nearly ten feet, the condor is North America’s largest bird. The species nearly went extinct in the 1980s, when the population crashed to only nine wild birds. A captive breeding program was started in which the young were hand-reared to maximize reproduction. The young were released into parts of Arizona and California, including Big Sur. There are now over 400 California condors, including about 230 in the wild. The final leg of our trip took us to Point Reyes National Seashore, a 71,000-acre park preserve located on a peninsula just north of San Francisco. Its rocky headlands, expansive sand beaches, bird-rich estuaries, open grasslands, scrubby chaparral, and upland pine forests make the park a naturalist’s and photographer’s delight. Nearly half of all North American bird species either nest, winter or migrate through here. In spring, the grasslands come alive in a spectacular floral explosion. After we got settled in the charming cottage we rented at the edge of the park, we made the half-hour drive to the lighthouse. Raptors were everywhere as we wound our way through sweeping grasslands and green pastures, where some dairy farming is still permitted. From the lighthouse, we looked down on barnacle-encrusted rocks covered with hundreds of common murres, a penguin-like seabird. We also scanned the ocean for the tell-tale “spouts” of gray whales, which were already migrating north. These whales make one of the longest of all mammalian migrations – a 12,000 km round trip between breeding and calving grounds in the lagoons of Baja California to summer feeding territories in the Bering and Chukchi Seas. After the lighthouse, we made our way to the Chimney Rock Trail, where rocky cliffs drop steeply to the ocean. The trumpeting of elephant seals – the sound can carry for over a kilometre – emanated from the beach below. We watched in amazement as a pair of large males fought for access to females. The latter had only just finished weaning their pups! Over the next two days, we managed to hike three of the park’s numerous trails. Abbott’s Lagoon Trail took us through coastal chaparral to a lagoon, sand dunes, beach and huge mudflats. The shrubs were alive with sparrows and even a few brush rabbits. I was hoping to see a bobcat, which are fairly common in the park and even seen during the day. Our most interesting find, however, was a covey of California quails. 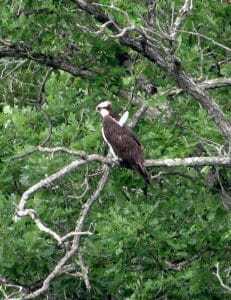 One of the males, with its a striking, black and white facial pattern and long, curved head plume, sat perched atop a trailside shrub, resplendent in the early morning sunshine. 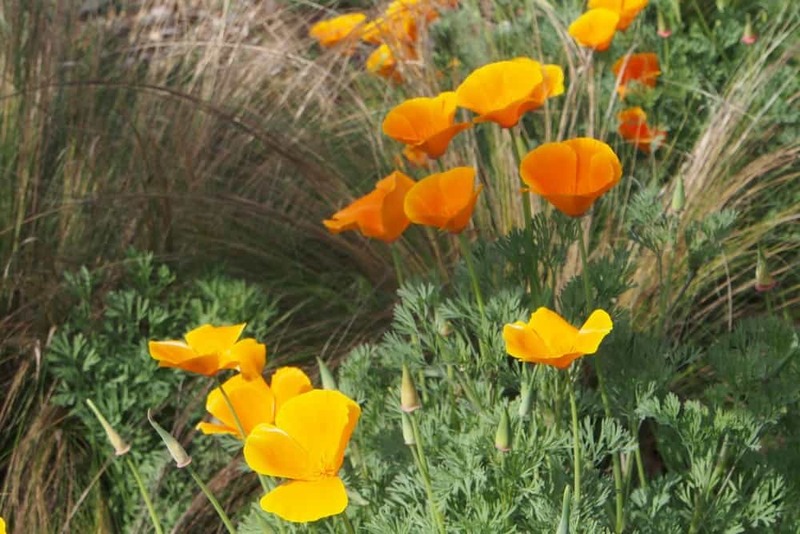 Here and there, orange-yellow California poppies, the state flower, were already blooming. 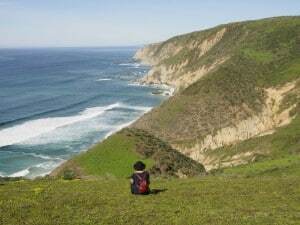 The Tomales Point Trail took us over high hills with magnificent views of the ocean and the 19 km Tomales Bay. The San Andreas Fault lies directly beneath the bay. It forms the tectonic boundary between the Pacific Plate and the North American Plate. Point Reyes sits on the Pacific Plate, while the rest of California is on the North American Plate. In the 1906 earthquake, the peninsula leapt nearly 20 feet northward in less than a minute! All of this is explained in detail on the Earthquake Trail near the main visitor centre. You can even see a fence that broke in two during the quake. One section now sits almost 20 feet north of the other. The Tomales Point area is also home to the Tule elk, a rare sub-species of the American elk. We watched a herd of 60 animals as they grazed on a hillside. To top off the hike, a pair of exquisite western bluebirds posed for us on the roof of an old barn. Before leaving Point Reyes, we walked along the Estero Trail, where bat rays and sharks are often seen. Shorebirds and ducks were abundant on the mudflats of the estuary. The trail took us through some large stands of rare Bishop’s pines, draped in lichens. Pink flowering currants were in full bloom and smelled wonderful. A little pishing on my part was sufficient to coax several pygmy nuthatches into view as well as a Bewick’s wren. If you want to visit California, I suggest you don’t wait too long. Climate change is having a profound impact on water resources, as evidenced by changes in snowpack and river flows. The on-going drought has killed millions of trees, and the warmer waters are wreaking havoc on native fish like salmon. Unprecedented warm waters off the Pacific coast over the past two years have led fish that marine mammals feed on to move to colder waters. This has resulted in record numbers of sick and starving sea lions. 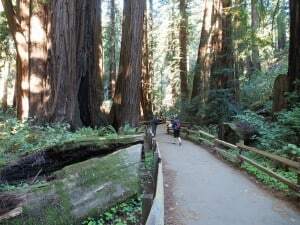 Increased global temperatures also threaten the cool, moist coastal zone of the state, which could mean the end of coast redwoods. These impacts should serve as another reminder – as if we need one – of the need for aggressive mitigation policies such as carbon taxes. Seeing exciting new plants and animals often requires effort – maybe rising at dawn and setting off on a long hike or driving for hours to some far-flung destination. Getting easy, close-up looks at iconic species right in the heart of a metropolis is therefore quite a treat. 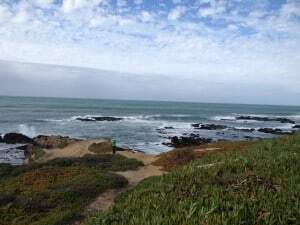 Such was our experience in a two-week trip to the San Francisco and Monterey areas. It was heartening to see how well species ranging from sea otters and elephant seals to monarch butterflies and spotted owls are doing in such a populated area of California. This was our first visit to the Golden State. My wife, daughter and I took advantage of a family wedding to make an extended stay and explore some of California’s fascinating nature, culture and history. For the first five days, our home base was Mill Valley, a lovely town located just north of the Golden Gate Bridge and set in picturesque wooded canyons. 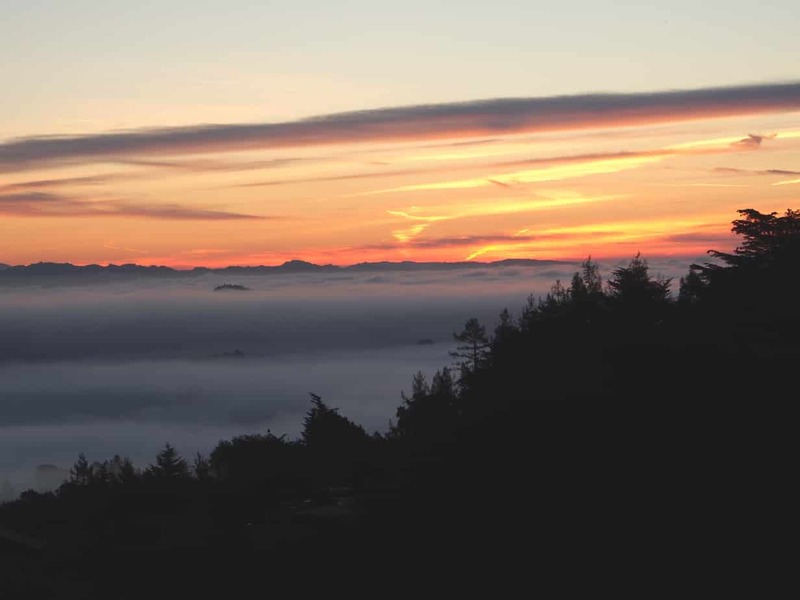 From the house we rented high on Mount Tamalpais, we awoke each morning to beautiful sunrises over the fog-covered valley and San Francisco Bay. Ravens and red-tailed hawks soared constantly overhead, their calls an unbroken presence. Anna’s hummingbirds darted among the blossoms in the garden, stopping from time to time to perch on an orange tree, while white-crowned and golden-crowned sparrows foraged on the ground. 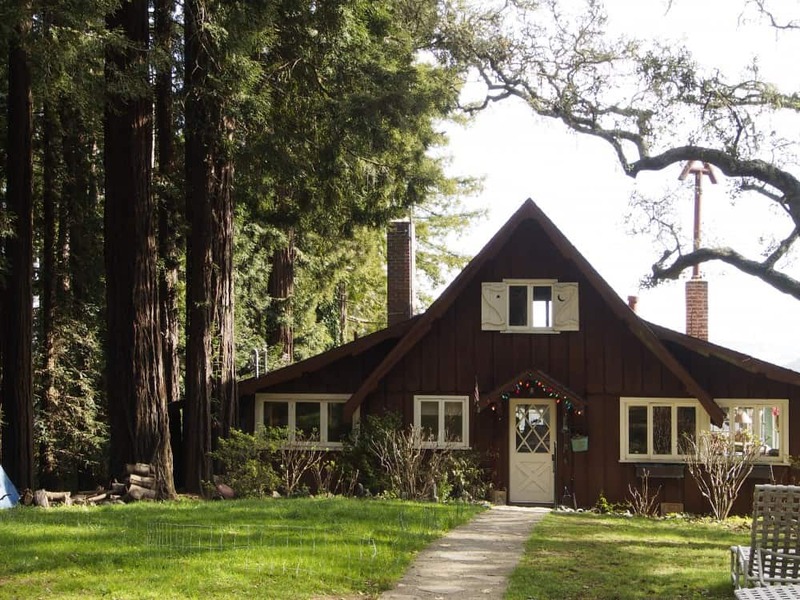 A dense forest of coastal redwoods bordered the property, providing both privacy and a sense of connection with an older, wilder California. The air was replete with the smell of the white jasmine vines that adorned the deck. The roadside down to Mill Valley was bordered by yellow-flowered acacia trees, interspersed among lofty, fragrant eucalyptus. Nearby Sausalito, famous for its houseboats and upscale hillside homes, was also a delight. Harbour seals and sea lions hunted just offshore, attracting hoards of western and California gulls each time they surfaced with food. Brown pelicans glided low above the water while loons, grebes and cormorants dove for food further out in the bay. Alcatraz Island and the imposing skyline of downtown San Francisco loomed in the distance. Following a great four-hour guided tour of San Francisco to get our bearings, we returned to the City by the Bay to wander its charming neighbourhoods like Pacific Heights and Russian Hill. Everywhere we walked – often huffing and puffing on the ridiculously steep hills – the streets were bordered by beautiful, pastel-coloured houses, many of Victorian style but none exactly alike. 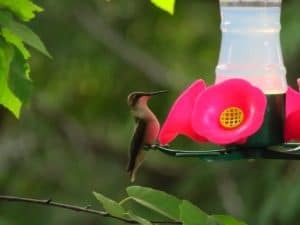 Bushtits, white-crowned sparrows and Oregon dark-eyed juncos flitted among the shrubs and trees of house-front gardens where red-flowered camellias, magnolias, candelabra aloes, and plums were in full bloom. The parade of different scents, too, was intoxicating. San Francisco is pursuing an ambitious urban forest plan, which was evident by the huge number and variety of new trees planted along the sidewalks. Many of them had watering bags zipped around the support posts. At Telegraph Hill, a famous San Francisco landmark and site of the Coit Tower, California towhees fed on the ground, while Wilson’s warblers and western scrub jays called from the iconic Monterey cypress trees. At one point, a flock of red-masked parakeets (also known as cherry-headed conure) passed noisily overhead, making me wonder if I wasn’t somewhere in South America. Native to Ecuador, these birds were released in San Francisco decades ago – probably by frustrated pet owners – and are now reproducing on their own. On Pier 39, at busy Fisherman’s Wharf, we got close-up looks at a colony of California sea lions, a fixture here since 1989. The Marine Mammal Store and Interpretive Center monitor the sea lion population each day, and educational information is provided to tourists. Sea lions can be distinguished from seals by the presence of external ear flaps and their ability to walk on land. Seals only have ear holes and move on land by flopping on their bellies. 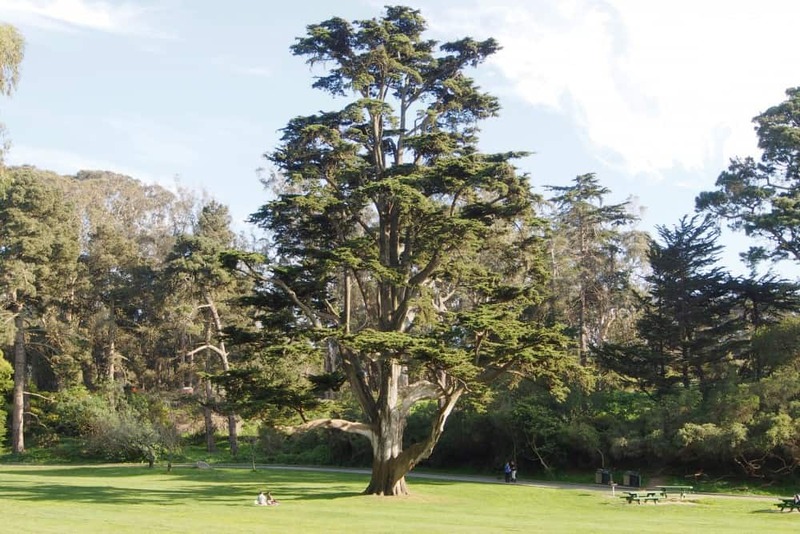 The crown jewel for exploring nature in San Francisco is Golden Gate Park. At five kilometres long and a kilometer wide , it is 20 percent larger than Central Park in New York. We spent an afternoon touring the park by bicycle. 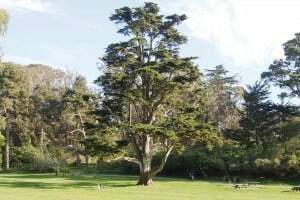 In addition to native trees like coast redwoods, Douglas fir and Monterey cypress, numerous non-natives like eucalyptus border the streets, pathways and meadows. It was hard to bike very far without stopping to take a picture or to grab our binoculars. The park contains a chain of lakes where we spotted a variety of waterfowl, including ruddy duck, American wigeon and bufflehead. 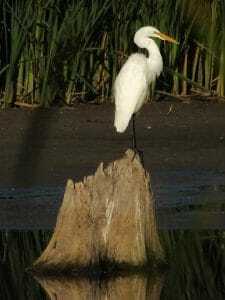 Wading birds like green herons and both snowy and great egrets were common, too. 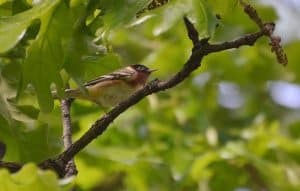 Along the trails, black phoebes, Brewer’s blackbirds, chestnut-backed chickadees and the ubiquitous white-crowned and golden-crowned sparrows popped up continuously. 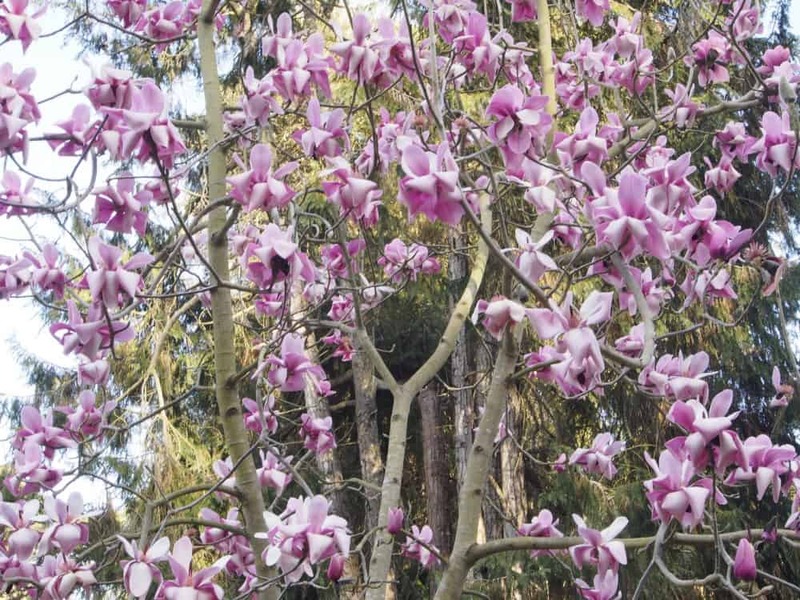 A must-see for anyone visiting the park is the 55-acre San Francisco Botanical Gardens. 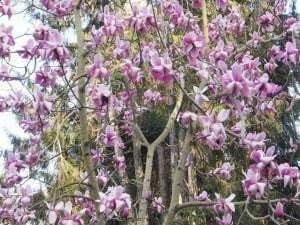 We spent most of our time exploring the California Natives and rhododendron sections, where dazzling pink and white magnolias were in blossom. The California section provides a great overview of the state’s flora and was our introduction to species such as manzanitas, madrone, live oaks, Ceanothus, California buckeye, and California bay laurel. We also enjoyed an interpretive trail that takes you through the story of plant evolution, from the spore-bearing plants of the Devonian period to the flowering plants of the Eocene. At the end of the trip, I also spent several hours at the California Academy of Sciences. It is one of the largest museums of natural history in the world, housing over 26 million specimens. Completely rebuilt in 2008, the museum is at the forefront of environmentally friendly design. 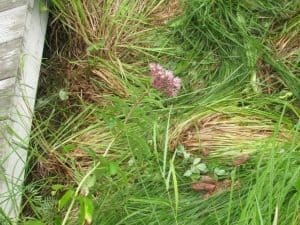 Most impressive is the two and a half acre green roof, which is planted with over a million California native species. A huge glass dome encloses a living rainforest, and the aquarium section includes a living coral reef, tide pool and the underwater ecosystems of the California coast. The Africa Hall has a fascinating exhibit on human evolution, while the earthquake section explains how seismic activity and plate tectonics has shaped both California and the world. There is also a superb exhibit on the role colour plays in nature, a naturalist centre, and docents to answer questions and provide hands-on experiences with many species. Along with the botanical park, the museum serves as a great introduction to the natural history of the state. 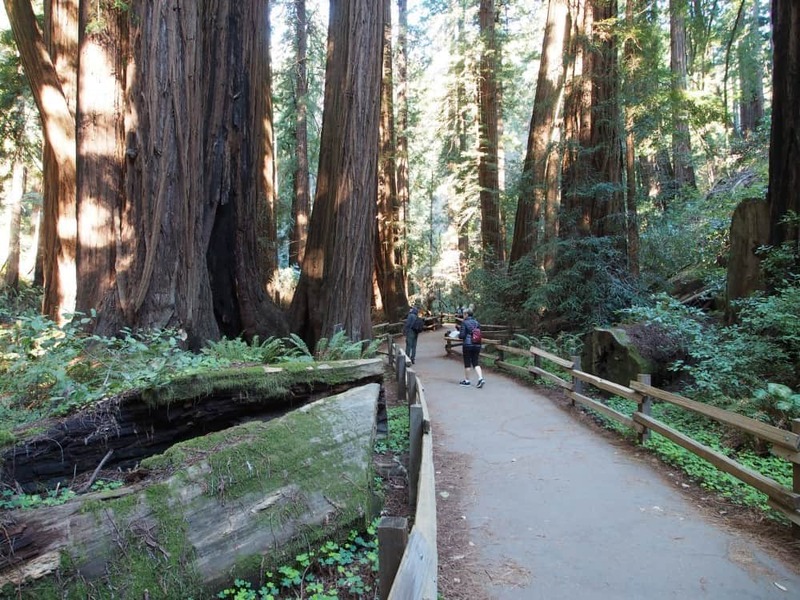 Before we left Mill Valley, we paid a much-anticipated visit to nearby Muir Woods National Monument. 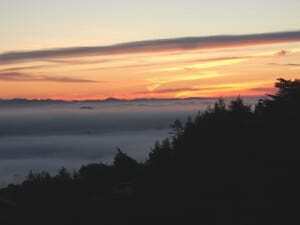 The park protects 554 acres of old-growth coastal redwood forest. The trees are often shrouded in fog, which provides up to half of their water needs. 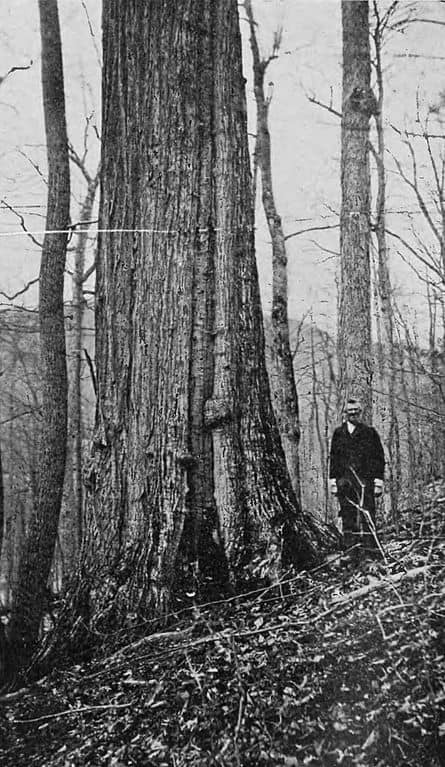 Related to the giant sequoia of the Sierra Nevada, many of the trees are over 200 feet tall and between 500 and 800 years old. Other common trees include California bay laurel, bigleaf maple and tan oak. 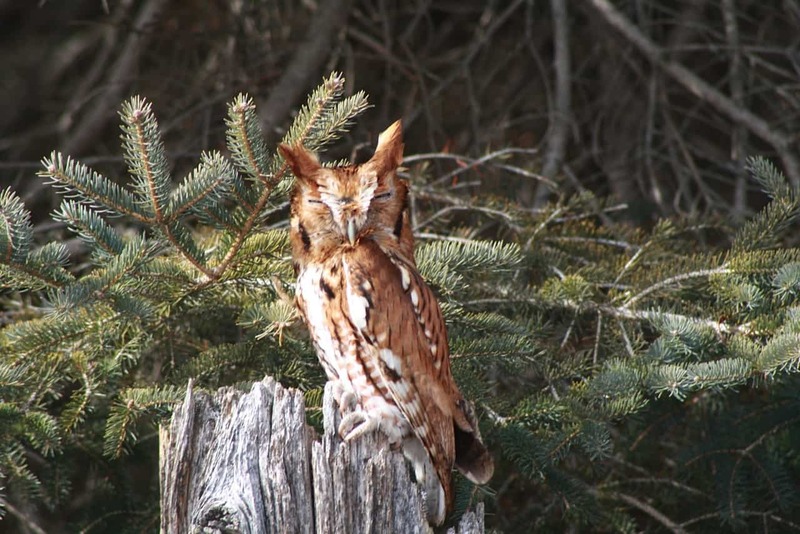 The forest is also home to northern spotted owls, which appear to be thriving. By arriving early on a weekday, we had the trails mostly to ourselves and could enjoy the calls of Steller’s jays and the remarkably long, tinkling trills of the Pacific wren. The forest floor was carpeted with horsetails, ferns and blooming redwood sorrel, interspersed here and there by Western trilliums, fetid adder’s tongue and vermillion cap mushrooms. We were also fascinated by the eight-inch banana slugs that glided across the forest floor. Later the same day, we made a short but beautiful drive to Stinson Beach on the Pacific coast. 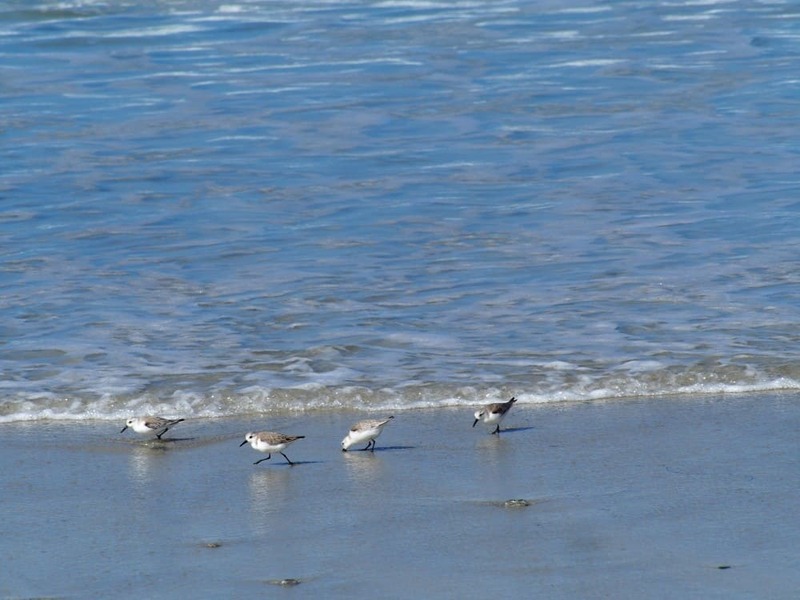 In addition to spectacular scenery, the beach is home to overwintering shorebirds like marbled godwits and willets. As we walked along the sand, we also got great views of Heermann’s gulls, resplendent in their dark grey breeding plumage. This area is also an overwintering site for monarch butterflies. With temperatures of over 20 C, the butterflies had already begun to disperse. We watched as dozens flew about in pairs, some stopping to mate on the grass. Instead of going to Mexico, the monarch population west of the Continental Divide fly to the coast of California to spend the winter. 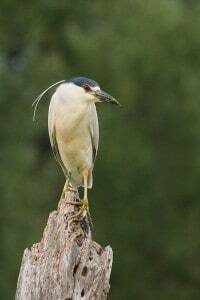 They cluster together by the hundreds or even thousands on the branches of pines, cypress and eucalyptus trees. The San Francisco area was just a foretaste of the natural wonders we were to experience in California. The second week took us south to the Monterey-Big Sur area and then north again to Point Reyes National Seashore. More about these next week. At 10:30 am on Sept. 19, we had 100 or so Monarchs congregating (roosting) in trees in our front yard at our farm on Chemong Road. 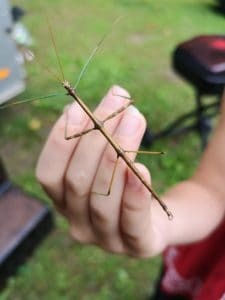 I’ve never seen one on our farm before. My husband had gone down our laneway and drove through the swarm, and called me from the end of the driveway to tell me about them. The wind seemed to be kicking up quite a bit at the time, so I wondered if they were taking shelter. Another group landed in the spruce tree beside the maple. I took pics of the Monarchs that were lower on the trees, as some were too high that I didn’t figure the picturtes would turn out. Note: 1-2 Monarchs still coming to Mexican Sunflower (Tithonia) in my garden in Peterborough. Two on Sept. 18 D.M. I had my first Monarch of the year today, June 7, at about 12 noon. It was flying over a field on the north side of Round Lake Road, about 1 km east of County Road 46. Round Lake Road is located about six kilometres north of Havelock. Rick Stankiewicz had his first Monarch yesterday,June 6th. It flew across his yard at 10 Hazel Cres. in OSM Township near Keene. If there were such a thing as Monarch Futures* on the market right now, I’d buy all I could. The immediate future for monarchs looks bright – there is a good chance the population will increase this year. Last year during the first week of May I predicted the monarch population would increase in 2014 and it did. 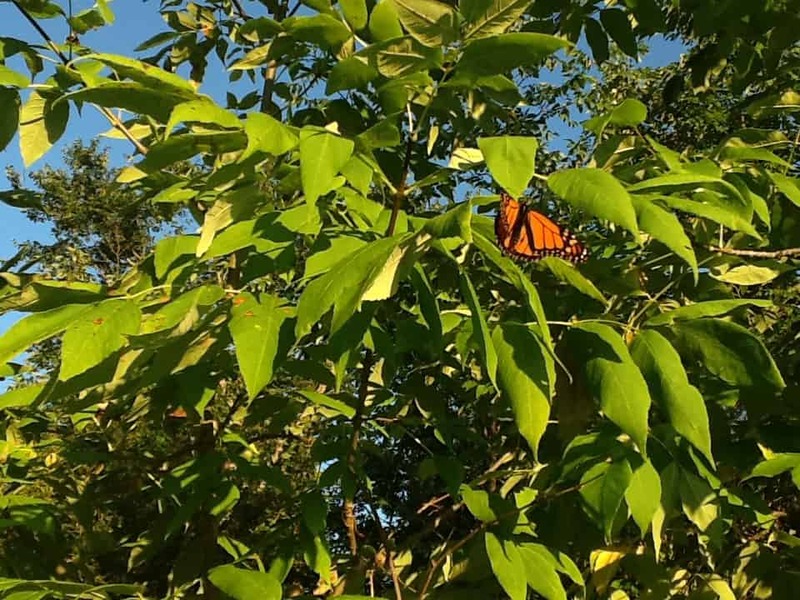 The total area of trees occupied by monarchs in Mexico (1.13 hectares) was less than expected but it was still an improvement over the all-time low recorded in the winter of 2014 (0.67 hectares). 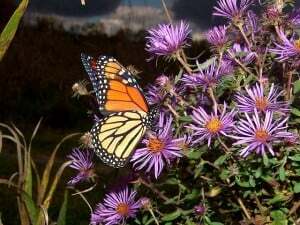 Fortunately, during the overwintering period (November-March) for both years the weather was relatively normal and the monarchs wintered well. 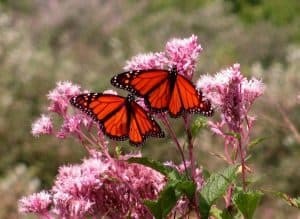 Monarchs begin moving north at the end of February in some years with small numbers arriving in Texas close to 7 March. The timing of the departure evidently depends on the local weather conditions and the movement north can be delayed by weeks. That was the case this year, with a first wave of monarchs arriving in Texas three weeks later than normal. 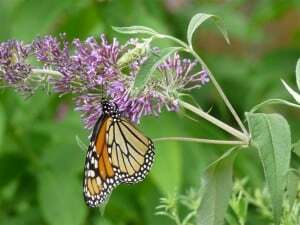 The arrival of monarchs in Texas has been delayed in the past by weather conditions that were similar to those seen this spring in Mexico and Texas – notably in 1996, 2005 and 2010. And guess what – in all three of those years, the population increased. In fact, they were the three biggest increases seen from 1996 through 2014. That sounds promising but it’s not a guarantee. The first generation monarchs (offspring of those returning from Mexico) still have to reach the northern breeding areas. Though I’m reasonably confident the population will increase, I’m worried about what would happen if 1) the size of the first generation moving north is smaller than expected or 2) they arrive too late in the northern breeding areas (as happened in 2013). If either or both of these occur, the magnitude of the fall migration and the size of the subsequent overwintering population might not increase. Looking ahead, the weather forecasts for the next 45 days appear to favor the northward movement of first generation monarchs. We just have to keep our fingers crossed that good numbers of these butterflies reach the upper Midwest by the end of May. While I’m optimistic about this season, the long-term scenario for monarchs remains in doubt. 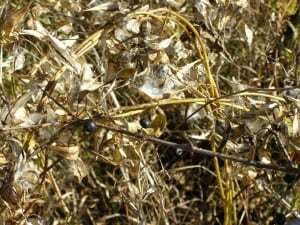 As you all know, habitat loss since 1996 – an area estimated to equal the size of Texas – has reduced milkweed/monarch habitat to the point where it is unlikely that even under the best of conditions overwintering numbers will exceed 4 hectares. 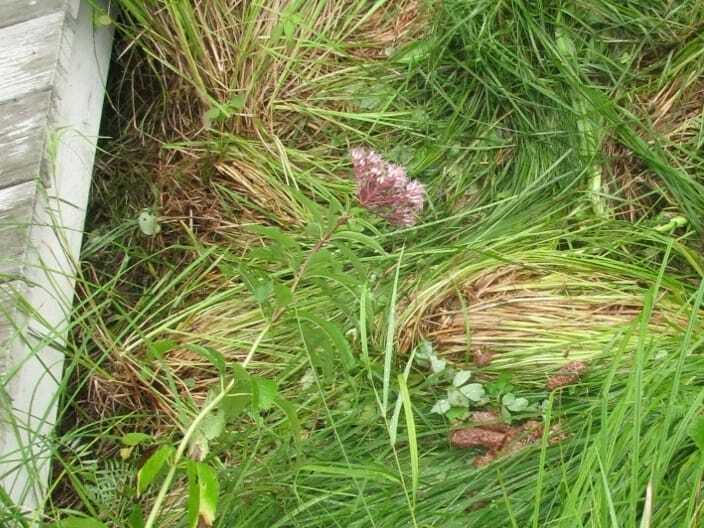 An overwintering population of 4 hectares is too few given the potential for catastrophic mortality during the winter months combined with unfavorable conditions during the breeding season (as occurred from 2011-2013). Further, there is the issue of annual losses of habitat. I’ve estimated these several different ways and have consistently come up with losses of 1-1.5 million acres per year. It’s clear – unless we restore at least a million acres of milkweed/monarch habitat a year, monarchs will continue to lose ground. Milkweed/monarch restoration is underway with the help of federal agencies, corporations, Universities, NGOs and individuals pitching in – yet the scale of these efforts is still small relative to the need. “My dear, here we must run as fast as we can, just to stay in place. And if you wish to go anywhere you must run twice as fast as that.” ― Lewis Carroll, Alice in Wonderland. Clearly, we need to restore more than a million acres per year – run twice as fast – to Bring Back The Monarchs. With the thoughts of seeing a good flight of migrating raptors tomorrow soaring through my mind, I sat out on the porch with my second coffee of the day, (Friday September 5th). It was 11:45 am, and the humid air was cooled some by strong breezes, so a nice balance of late summer heat with good airflow. I suddenly heard the familiar “klinking call” of at least one or two upset starlings. As I raised my eyes to spot the offending raptor, I was somewhat surprized not to see a Cooper`s or Sharp-shinned Hawk, but instead a Peregrine passing just out in front of me in very fast level flight, speed being maintained by quite stiff and shallow strokes of the wings. 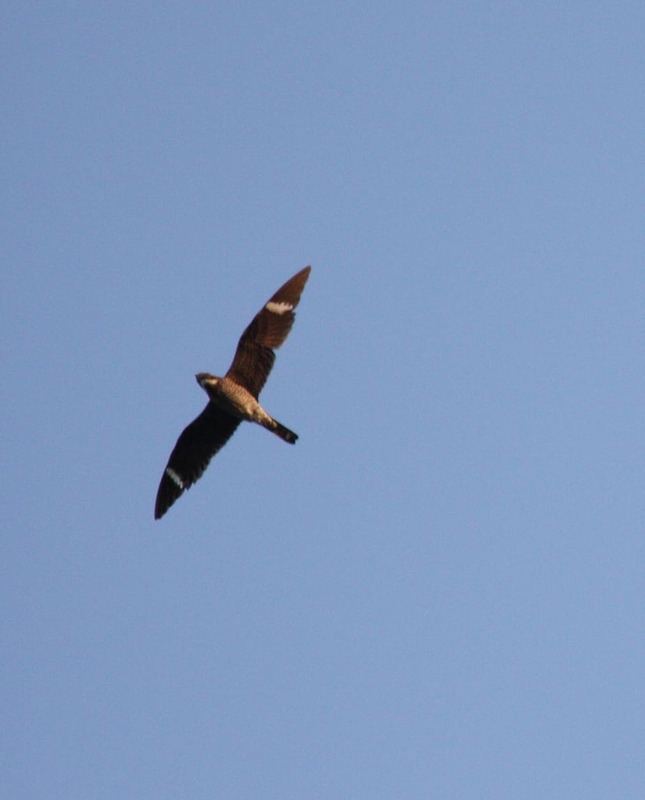 Flying directly away from me – it must have just passed straight over the porch where I sat – I looked on ahead of the falcon in time to see three or four pigeons on my neighbour`s barn roof peak. I was surprized at how close, (appeared to be ten meters or less), that the falcon actually got to the closest pigeon before they, and nearly 30 previously un-seen others, took to the air and immediatly balled up. During the second swipe of “the ball” of pigeons, the falcon managed to pry one bird from the tight group, and the chase was now one of focus and determination. The distance between the two was kept to about 20 meters, but interestingly, (and somewhat typical), the falcon closed the distance to about only two or three meters once the pigeon began to climb. Just as one would expect to see the pigeon ripped and transformed into a descending comet of feathers, it twisted, dropped sharply, and managed to wind up flying back the other way. (The kind of move that would have torn the wings clear off of a WWI bi-plane!!) My hat is off to this skilled pigeon. It often winds up going the other way, once the falcon closes the gap that much, and that quickly. The defeated, (though now wiser), falcon left the area after the “flying lesson” given by the pigeon, and headed out over the trees and eastward towards where it must have come from only half a minute before. The Peregrine was a HY (hatch year, or immature) bird. I`m guessing that the pigeon may have been somewhat older based on the impressive way it “handled” the situation. Either that, or it took one very risky chance, one that for now at least, has payed off. Next day, (the 6th), I had got up a little later than I had hoped to, having stayed up half the previous night enjoying the storm. I took a chair out into the field to spend some time hawk watching, as migration was now on and we had just had a sharp cold front which would enhance conditions for raptor migration. No sooner had I sat down, and along came a Sharp-shinned Hawk which pulled up to land in a large, isolated ash tree in the field. It sat for about 20 minutes preening and looking around the surrounding countryside. 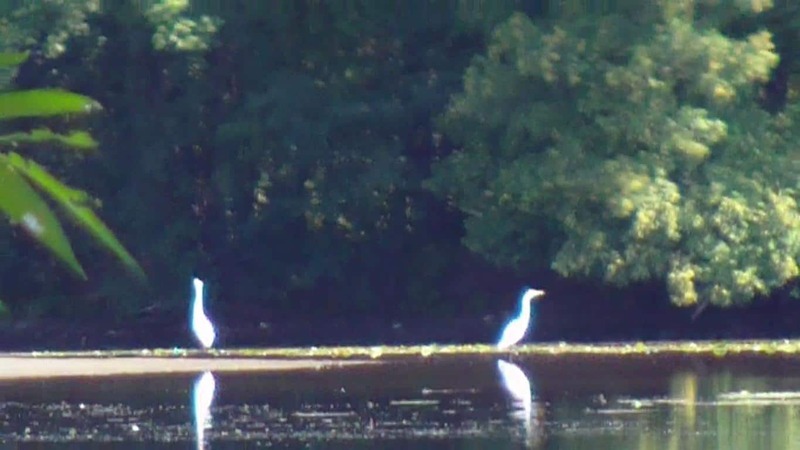 I had plenty of time to watch it closely and determine that it was a second year (sub-adult) female with her pale orange eyes and fairly dull, yet nearly complete adult plumage. It was easy too, to see that she was on the larger end of the Sharp-shinned scale, especially when she flew. I stayed in the field for only 90 minutes before I had to get on with daily chores, but before I left, I had counted 14 monarchs. Most were flying overhead from 10 to 20 meters up, but a few were low, and visiting New England Asters and goldenrods. The only other “raptor” I saw was a turkey vulture as I walked through the field back home. So, off to the store and the local dump I went. Though they were in pockets, thicker in some places and absent in others, I ended up counting a day total of 48 monarchs, (16 more than I saw during all of 2013!) While out driving, the best spots seemed to be anywhere where there were lots of goldenrods and other yellow flowers, New England Asters, and damp sandy spots with puddles left over from the rain the night before – I saw 11 at my local dump alone, and all were hanging around damp sand there. Well, my predicted “big hawk flight day” was somewhat of a bust, but for monarchs, I will not complain. I saw another 8 on Sunday, and 8 again on Monday, but have not seen another since then, (and it is now Thursday morning.) And so, at this time, my 2014 monarch total stands at 148. 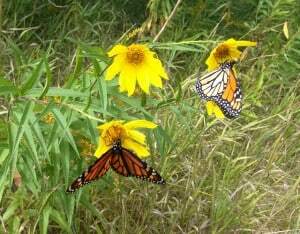 My husband and I took these photos of Monarchs on Monday, Sept. 8. We live about 10 min west of Keene. The Monarchs certainly seems to enjoy goldenrod. The northwest winds this past weekend provided a welcome tailwind and therefore led to a big flight of southbound Monarch butterflies. Tim Dyson had a HUGE one-day Monarch total with 48 seen on Saturday (Sept. 6). His 2014 Monarch total now stands at 140. I counted at least 10 Monarchs on Saturday and another eight on Sunday. 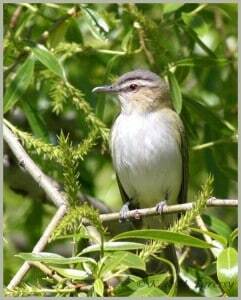 Warblers and vireos were also on the move. On the Peterborough Field Naturalist Sunday Morning Bird Walk, we were able to find Nashville Warbler, Wilson’s Warbler, Black-throated Green Warbler and Red-eyed Vireo. Other observers found even more migrants, especially Ian Sturdee. Click on “Checklist” under his Bay-breasted Warbler sighting below. “Those of you who follow monarchs closely are aware that the monarch population has been declining for the last 10 years with significant drops in the population each of the last three years. The number of trees and total area occupied by monarchs in the oyamel fir forests in Mexico was at an all time low last winter – a mere 0.67 hectares. This decline has given rise to a great deal of concern about the future of the monarch migration. These concerns have resulted in many meetings and plans, and even a Presidential Memorandum directing federal agencies to devote resources to offset the decline in monarchs and pollinators. 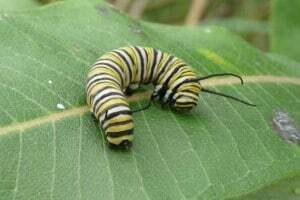 We have addressed this issue through our Monarch Waystation, Bring Back the Monarchs and Milkweed Market programs. These programs are growing but they need to become much, much larger to sustain the monarch migration. Large-scale habitat restoration, particularly in the upper Midwest, also needs to become a priority. In the meantime, we need to keep tagging monarchs as a way of monitoring their numbers and tracking any shifts in the origins of monarchs that reach Mexico. If you are a long-term tagger, you know it has been increasingly difficult to find enough monarchs to tag, especially during the last two years. The totals tagged each year roughly parallel the numbers recorded in Mexico each winter, giving us an independent assessment of the numbers in the migration. 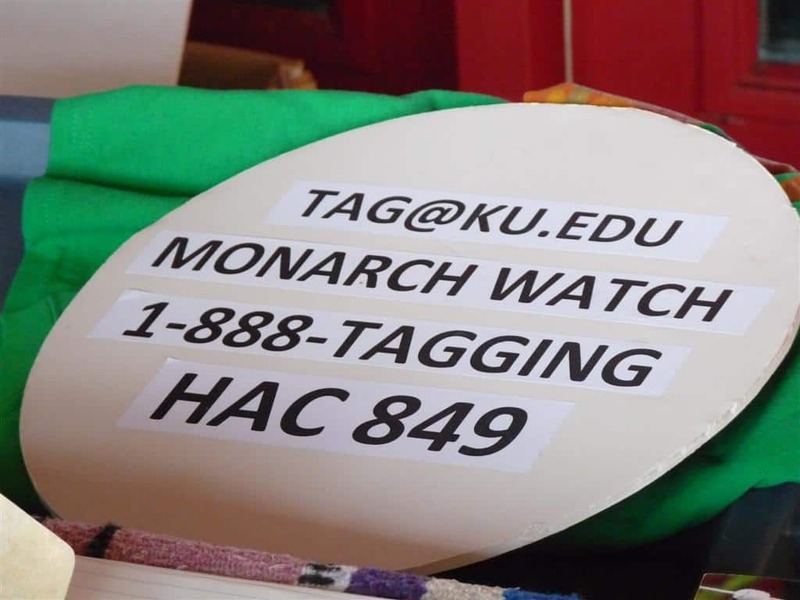 Regional tagging success also helps in that it demonstrates how monarchs respond to the physical conditions and quality of the habitats in these areas. Thus, tagging is an important tool to help us understand the overall dynamics of the monarch population. So what should we expect this year? I usually like to wait until August to make predictions about the numbers in the migration and avoid bold assertions about the size of the overwintering population until well into the migration. However, this year I’m on record as early as the 3rd of May on our discussion list Dplex-L as predicting that there will be a modest increase in the number of monarchs in the migration and at the overwintering sites this winter. “Modest increase” is a vague term and I can’t put a number to it; however, all of the factors I’ve researched indicate that there will be more monarchs migrating this fall and at the overwintering locations by mid December when the colonies are measured. All in all things are looking up for monarchs this year. 1. I looked at reports from those visiting the overwintering sites about the mortality seen at the colony locations. I also watched the weather in Mexico to be sure that there were no unusual weather events at the overwintering sites that would contribute to mortality. Fortunately, though the population was low, it seemed to winter well. 2. 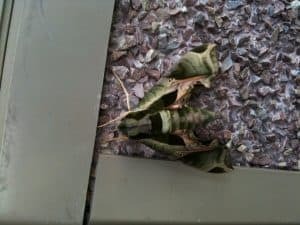 I followed the first sightings reported to Journey North and monitored, as closely as I could, the conditions of the milkweed and flowering of nectar sources in Texas. Since lower than normal temperatures in Texas in March and early April are also associated with an increase in the population, I monitored the temperatures in the region as well. Again, all the signs pointed to a slight growth in the population. 3. The temperatures during May and early June are another key to population growth. These temperatures largely determine when the first generation monarchs coming out of Texas and Oklahoma will reach the northern breeding area. Past records have shown that the timing of arrival of these monarchs in the north (i.e., >40N) is also critical. 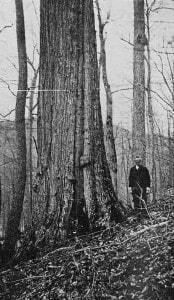 First sightings suggested fair numbers arrived during the critical period in the upper Midwest, smaller numbers arrived later in MI, OH and ONT and, still later, even fewer reaching the New England area. All of which suggested that most of the increase would come from the upper Midwest assuming that summer temperatures were normal or above normal. 4. A look at the longer-term temperatures suggested that normal temperatures could be expected over most of the northern breeding area, further supporting my optimistic outlook through May and early June. We finally had a Monarch show up in our garden on August 17. 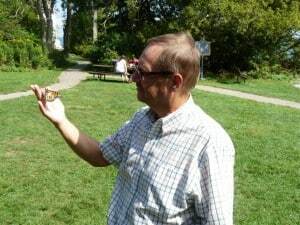 As of today, local naturalist Tim Dyson has counted a total of 46 Monarchs so far this summer. Tony Bigg, another inveterate butterfly watcher, was up to 61 Monarchs as of this week. He had 14 all of last year! Tony has seen a total of 83 species of butterflies in Peterborough County so far this year. On August 18, a Giant Swallowtail also made an appearance in our garden. 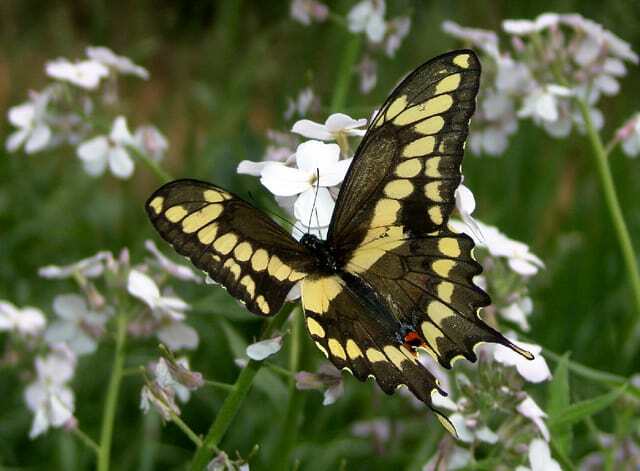 According to Tim Dyson, this is the second flight (second generation) of Giant Swallowtails. So far, he has seen 11 of these second generation swallowtails.